My planned ‘campsite’ for the night was the car park at Cow Bridge near the village of Hartsop. 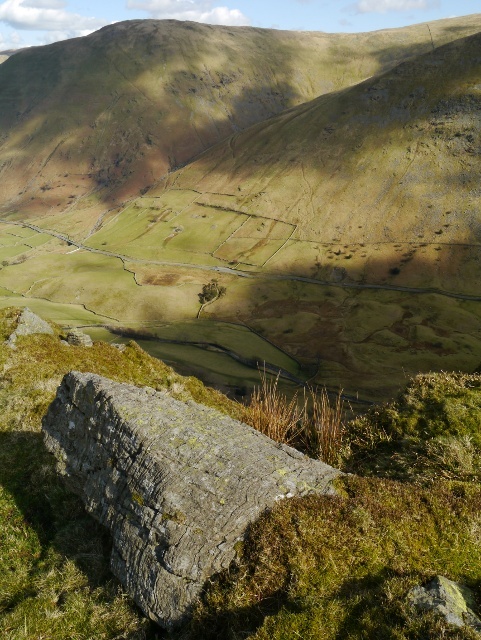 The drive over the Kirkstone pass was spectacular in the early evening light, stars beginning to make an appearance. I chose a pleasant spot next to the river to park, noting that there were already three vans who looked like they would be there until the morning. The evening and night passed peacefully and I woke up at 7.00am to a slight frost and sunshine filtering down into the valley. Even after getting up early I still managed to faff around for far too long and it was 8.30am before I set off with Reuben. The climb started immediately from the car park, a narrow path branching up into the woods. 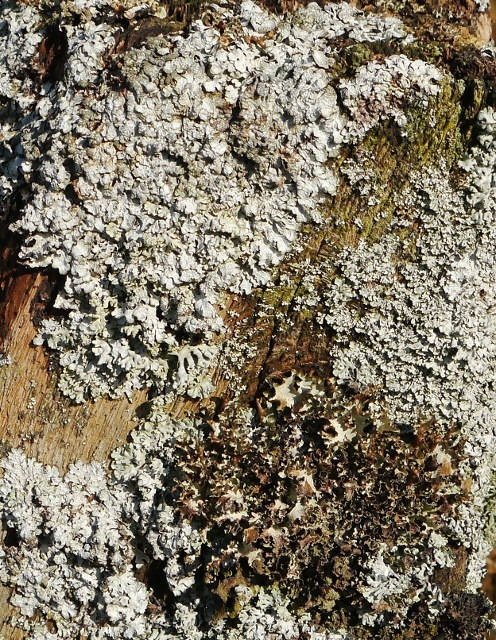 I was soon sweating buckets in the still air of Low Wood, even though the sun was low in the sky. I was very proud of Reuben as we rounded a corner and surprised a very woolly sheep, he looked with interest but resisted the temptation to go and investigate. He received lots of praise for that. Exiting the woods onto open pasture we found a spot to rest and take in the views. 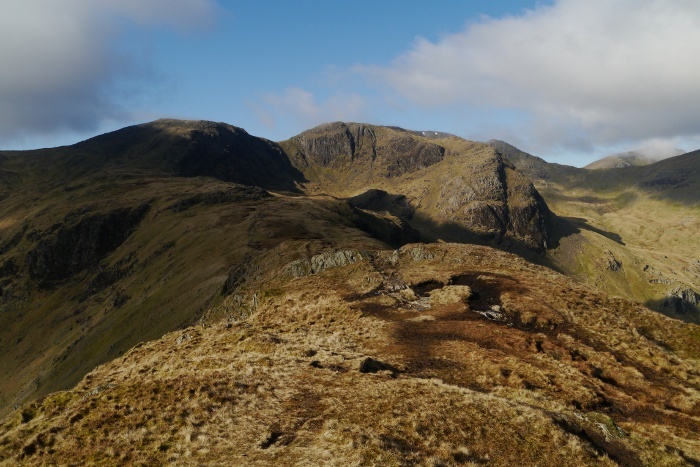 The first objective of the day was the summit on the knobbly ridge of Hartsop above How. 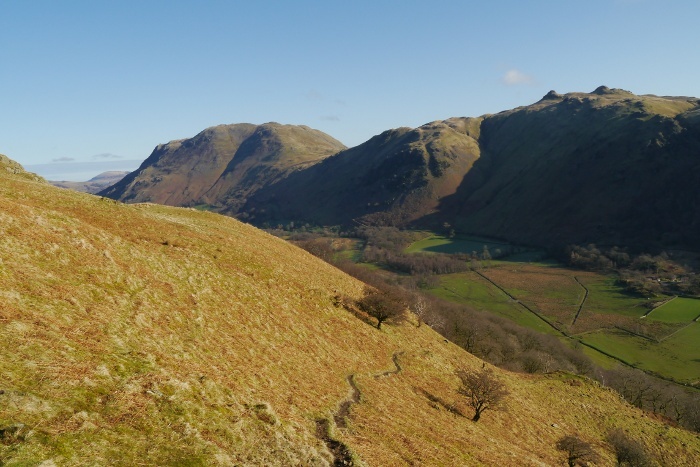 Once the ridge itself was gained the walking was easy and the views fantastic in the morning light. In front was a sense of mountain drama, the area around Link Cove looking particularly inviting and possibly worth exploring for its wild camping potential. 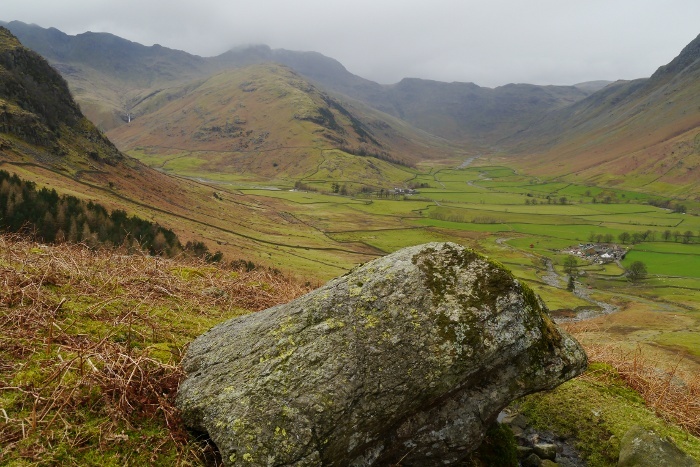 St Sunday Crag across Deepdale had its head firmly hidden in the clouds, its summit being a mist magnet under reasonably clear skies. Past the summit of Hartsop above Howe there was a small descent and then a long slow plod across grassy slopes towards Hart Crag. The reward was the panorama opening up behind me with every step. A great excuse to stop and look, nothing to do with trying to catch my breath! 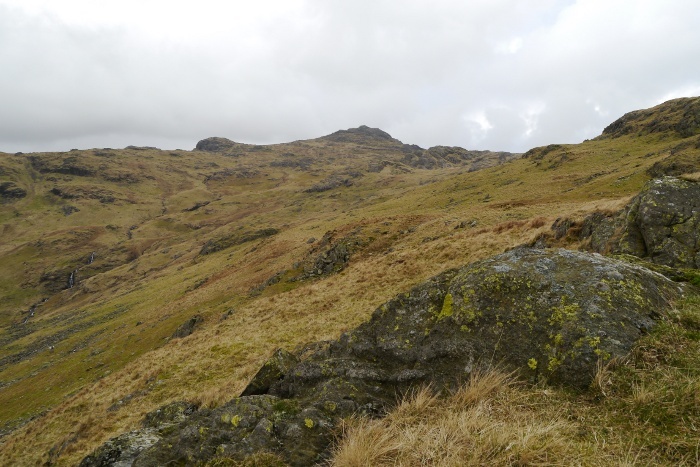 The final pull onto the summit of Hart Crag was steep, although this means that height is gained relatively quickly. I could not decide which of the two cairns was the true summit so we visited both. The views to the west were impressive and I stood for a while attempting to identify the array of well know peaks. Sadly the light was not at its best in that direction which means that it was almost impossible to photograph. 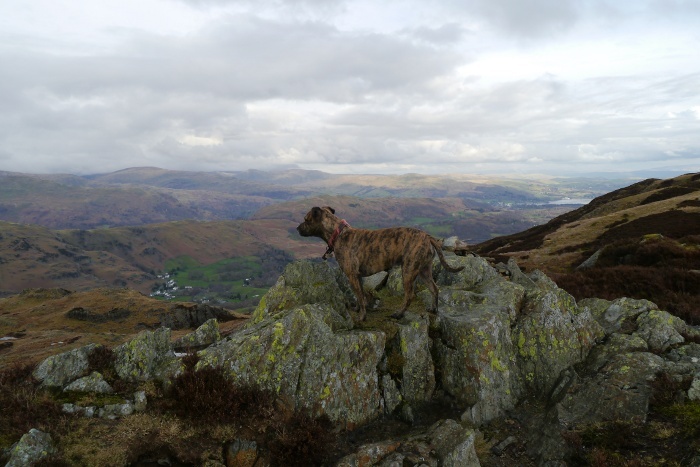 We left the deserted summit and walked the gentle slopes to Dove Crag. A drystone wall runs along the summit and we used it as shelter from the wind whilst we ate an early lunch. I saw ‘we’ but in reality this involved Reuben watching me eat and then him hoovering the ground for any stray crumbs. I noticed that just about every male that had passed was wearing shorts. 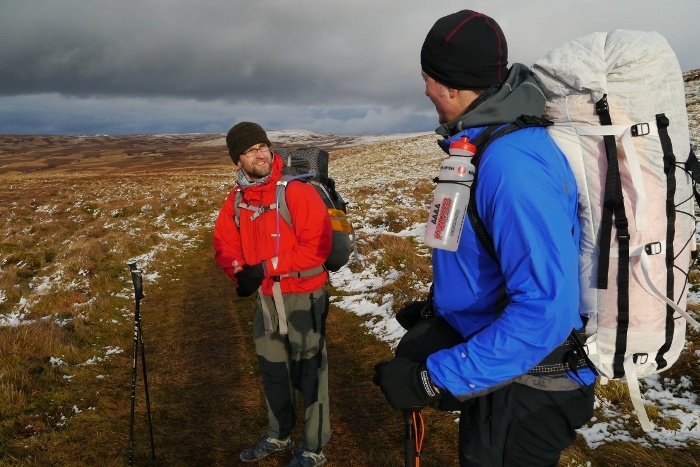 Although warm in the valleys it was pretty chilly on the fell tops, emphasised by the fact that I soon had to get moving to keep warm. 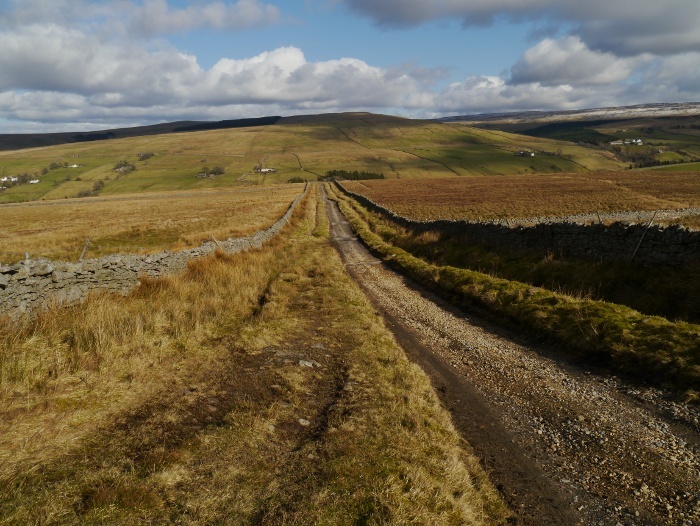 The well-worn path was left as we branched off towards Little Hart Crag and started the steep descent down to Bakestones Moss. 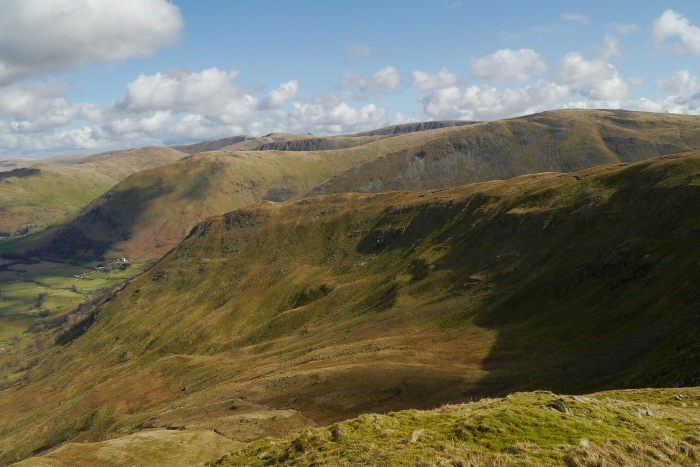 I was struck by the views across to High Street, wave upon wave of hills, each one getting progressively higher. 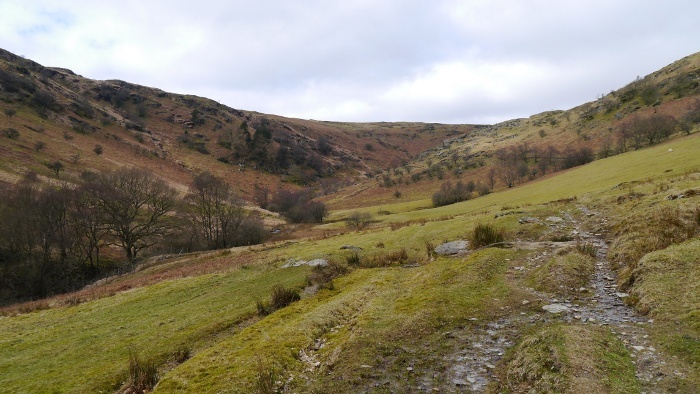 Before the final rise to Little Hart Crag I went to peer over the edge and down into Dovedale, the steep slopes gave me a real perspective of height. Signs of spring were evident as we passed a boggy pool full of frog spawn. The fluffy white clouds drifting across a soft blue sky were reflected in the dark surface of the water. It was windy on the summit but it was still a place to linger as the views of the crags at the heads of the valleys were impressive. 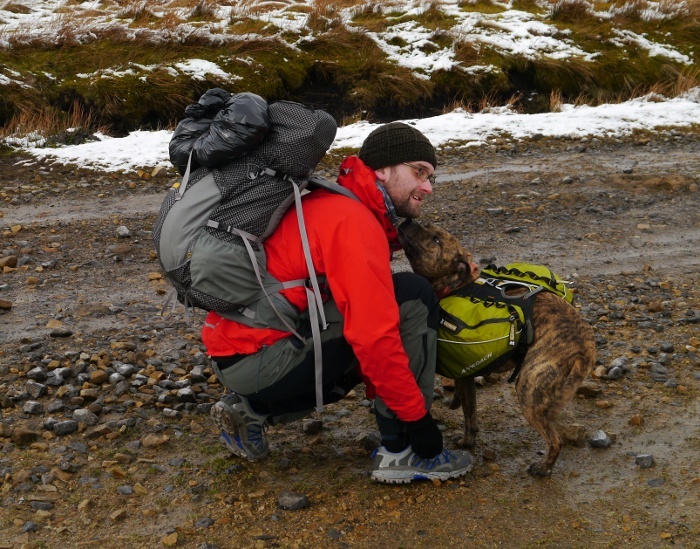 As we sat there a man approached the summit cairn with his Jack Russell and I told Reuben to stay at my side. However after a few minutes the sheer excitement of another dog being in close proximity meant that he broke ranks to say hello. He did not get the greeting he was looking for and I had to sheepishly apologise to the owner of a cross Jack Russell. 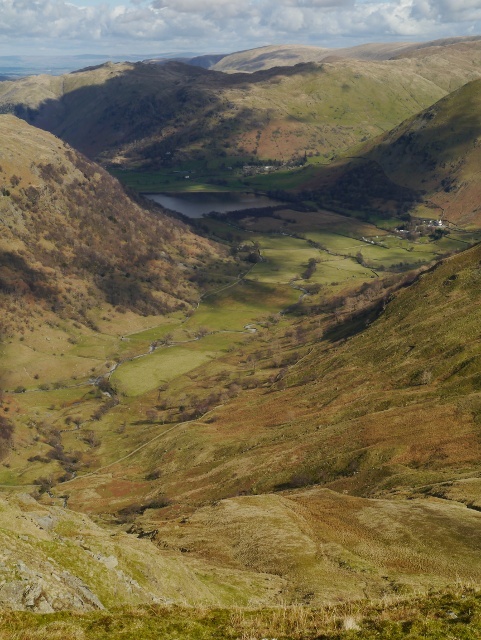 As I was about to start my descent towards High Hartsop Dodd I overheard a woman inform her walking partner that she was unhappy and pissed off that he was making her detour to its summit. I followed at a short distance behind, their body language telling more of a story than words ever could. 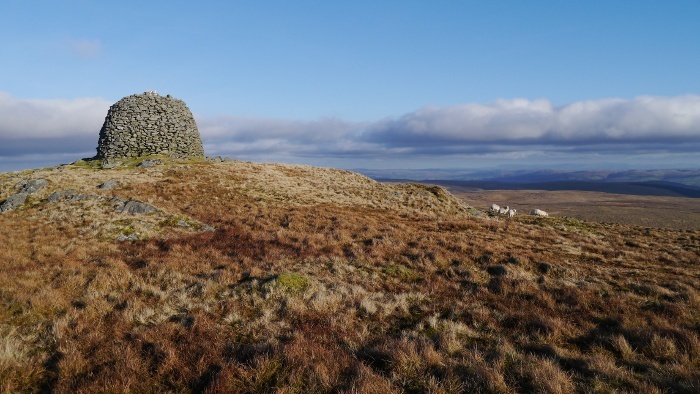 As I reached the tiny cairn they had turned around to reascend Little Hart Crag and he mentioned that it had not been worth the effort of their detour! 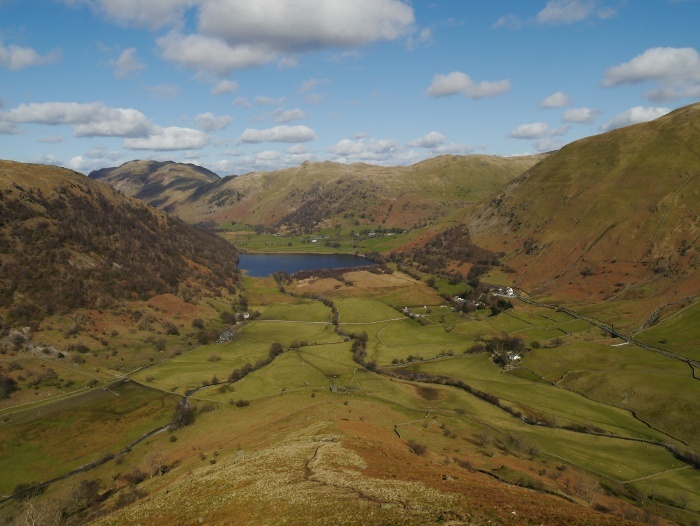 The tight contours of my map were confirmed by the steep slopes on the ground as I started the descent towards Brothers Water. It was hard going on the knees and it got warmer and warmer the closer we got to the valley floor. 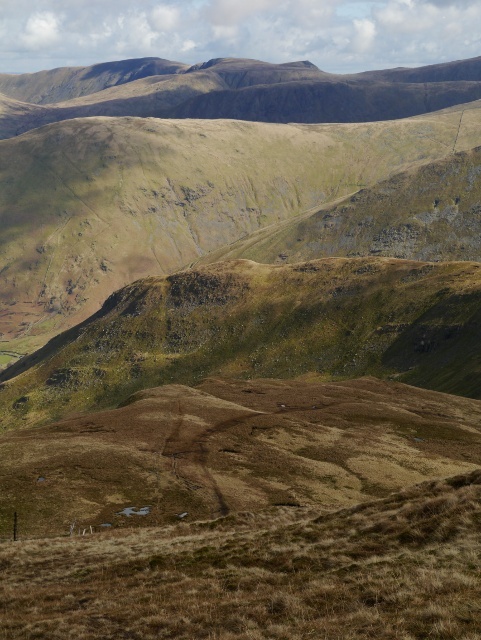 The Kirkstone pass far below us was busy with Sunday traffic, although the only sound that carried upwards was that of powerful motorbikes. It was with relief that we reached the valley bottom and I selected a boulder to sit on for a rest and to finish the last of my water. I was regretting wearing my leather boots as my feet were cooking within the confines of a waterproof lining. Time to put them away for a few months and go back to the freedom of unlined mesh trail shoes I think. I enjoyed the easy walk along the shore of Brothers Water, passing a family having a picnic in the sun on a stony beach. What I was not prepared for was the car park where I had left the Bongo. At 8.30am when I departed there were only a handful of vehicles but on returning the place was heaving and the van was firmly wedged in with only inches to spare either side. It took me ages to manoeuvre myself out. I do wish that people would realise that vans are more difficult to get out of tight spots than cars and they have numerous blind spots. With the stereo on and the windows down I started the slow scenic drive home along the shores of Ullswater. There was a humid and fetid funk in the air when I woke up. The van had been fully sealed from a night of Lake District weather, rain beating a repetitive tune on the roof all night. I had arrived at the disused quarry with Reuben at around 2.00pm the day before in less than appealing weather. The hills had vanished and a constant driving rain fell, accompanied by swirling mists. 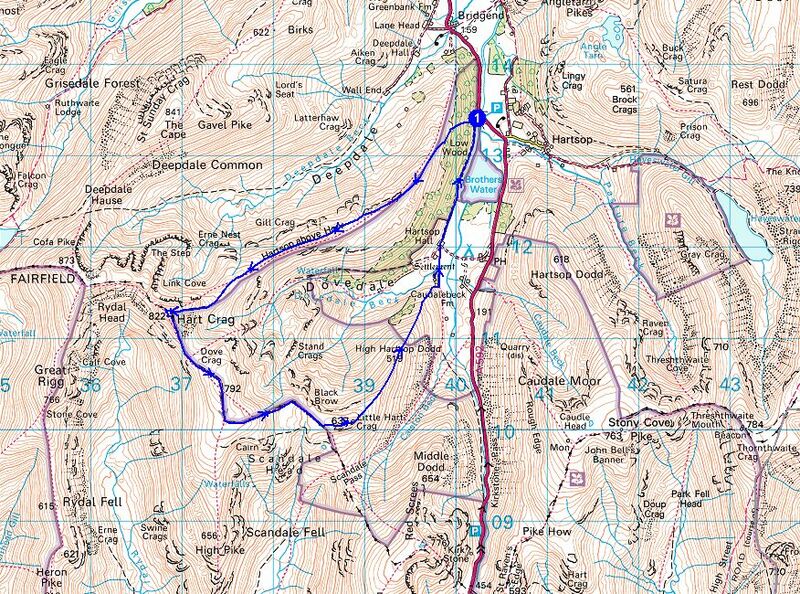 We completed a 7 mile dash across a couple of low hills simply for the sport of ticking them off my list of Wainwrights. Even at a lowly 300 metres the hills firmly had their heads in the clouds. We returned to the van just as it was getting dark, Reuben covered in muck and totally soaked, whilst the watery onslaught had been too much for my eVENT waterproof. I was thankful that we did not have to sleep confined in a small backpacking tent. However a smelly, wet and muddy dog in a small van along with my sodden clothes and shoes soon turned the atmosphere to that of a particularly smelly sauna. The rain had stopped when I poked my head out of the door and there were pale patches of blue in the sky. Mist was rising and falling around the surrounding mountains, the tops appearing and then vanishing in the clouds. It was an atmospheric place to sit and eat breakfast, the quarry giving an excellent alternative to a busy campsite. 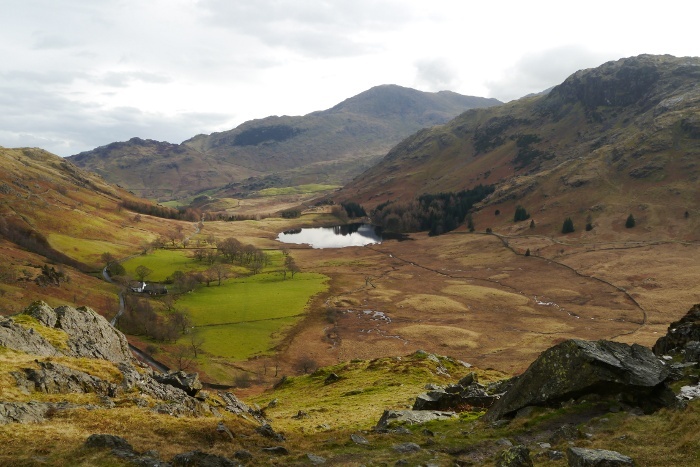 The day was improving rapidly as I drove through little Langdale and up to the empty car park next to Blea Tarn. Sadly it is pay and display and I went over to the machine to submit a couple of quid to the National Trust who own it. My exact words when reading the all day tariff was “**** *** ******* ***?” They wanted £5.90 and the machine does not give change, effectively costing £6. I was about to go and remove the Bongo from the empty car park so I could park irresponsibly nearby when I noticed the machine flashing that it was out of order. I therefore decided to leave the van where it was. I have no qualms about paying for parking, especially in areas where it is possible to reach by using public transport. However when in the middle of nowhere and there is no alternative to driving I think that £6 is a royal rip off. All it does is encourage people to park elsewhere, causing difficulties on the narrow lanes. Rant over. Reuben did not share my early morning annoyance and simply thought that the area was full of fantastic smells. I rarely visit the Lake District preferring much bleaker and emptier landscapes. 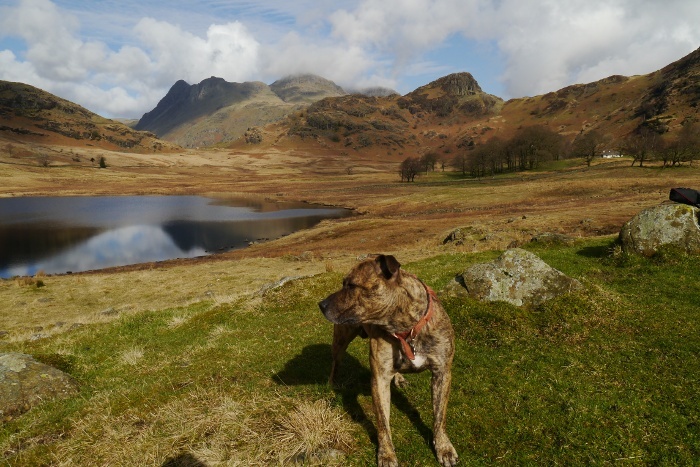 However standing next to a deserted Blea Tarn in the early spring sunshine I felt that there was nowhere else better to be on the planet. I imagine that Blea Tarn would normally be crawling with people, so I felt lucky to visit whilst it was so quiet and I could have lingered for much longer. 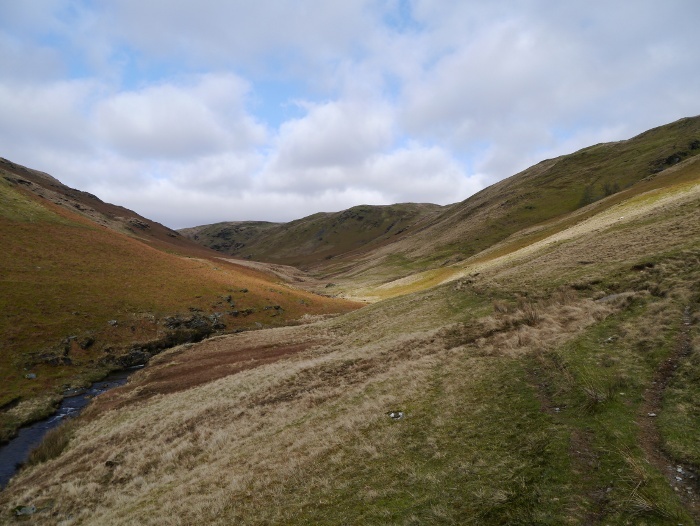 We took the footpath to the south of the tarn before following a series of sheep trods directly up the fell side. My lungs were soon heaving and my legs like jelly, unconditioned to such steep slopes. 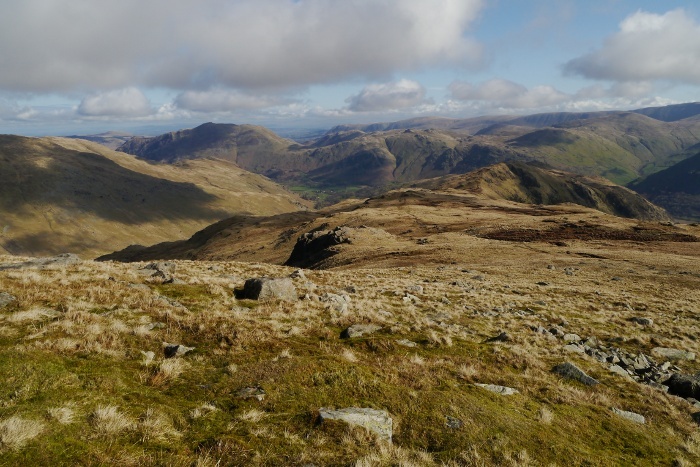 With height gained we contoured below Blake Rigg on easy grassy slopes, slowly climbing onto Wrynose Fell without too much effort. 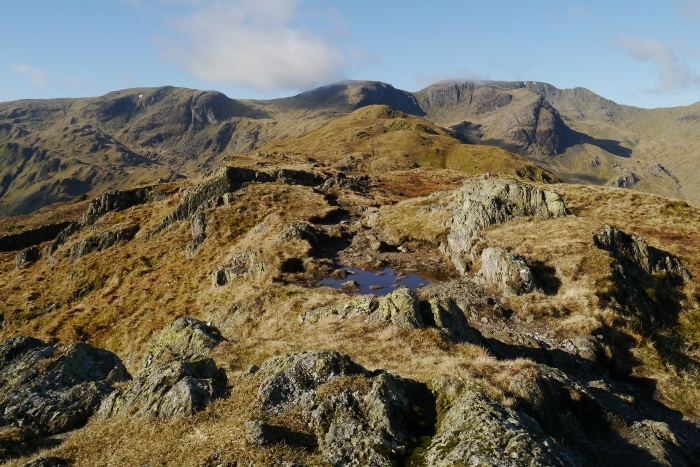 Wetherlam and the ridge up to Great Carrs looked impressive and I imagine would give a good horseshoe walk around the Greenburn Valley. A narrow ribbon of tarmac snaked its way across the hillside below us before steeply climbing to the high point at Three Shires Stone. 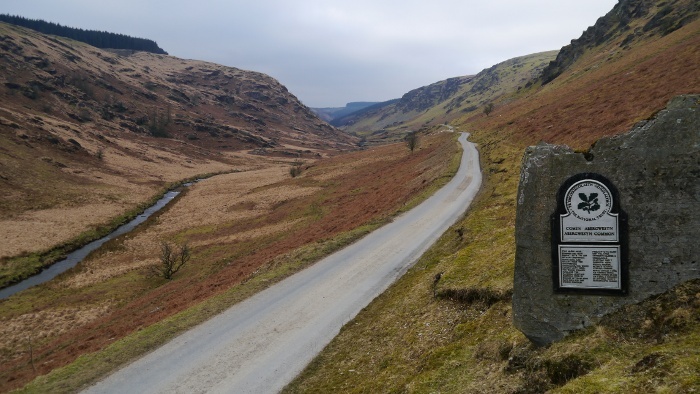 I stood with Reuben and watched as tiny toy sized cars silently glided up and down one of the steepest roads in the country, probably en-route for the Hardknott pass. Rounding a corner the cone of Pike of Blisco came into view, the only 2000ft fell in this part of the Lakes that I had not climbed. The cloud was now quickly rolling in, occasionally brushing its summit. I wanted to reach the top before the mist came down and the views were lost. Just as I found a sheltered spot on Wrynose fell for a mid morning snack and with the contents of my rucksack emptied on the hillside, heavy sleety rain started to fall. 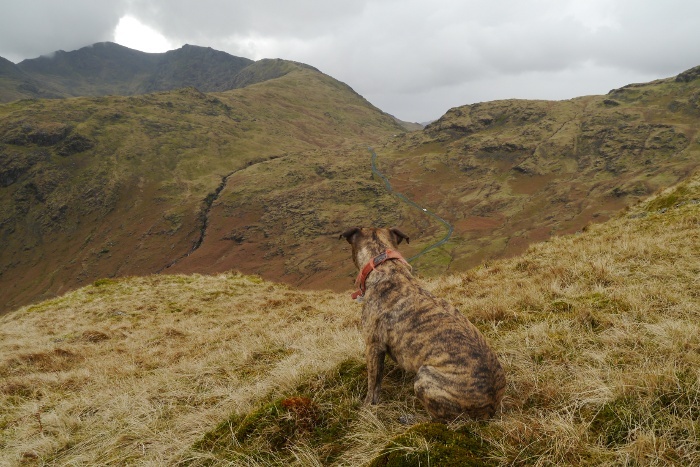 With waterproofs on and Reuben starting to whine as the wind blew the rain into his face, the break was abandoned and we began to climb once more. 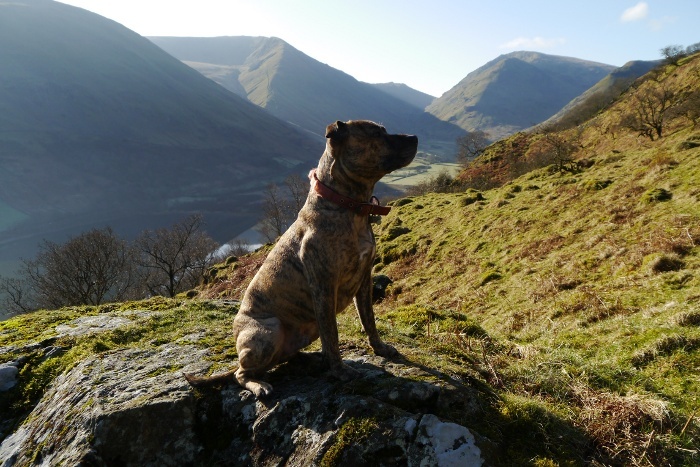 Reuben tends to forget his discomfort when his attention has been diverted to exploring the hillside with his nose. The summit cairn was reached just as the rain was turning to wet snow, my waterproof once again being defeated by wet and sweat. Time to reproof it I think. 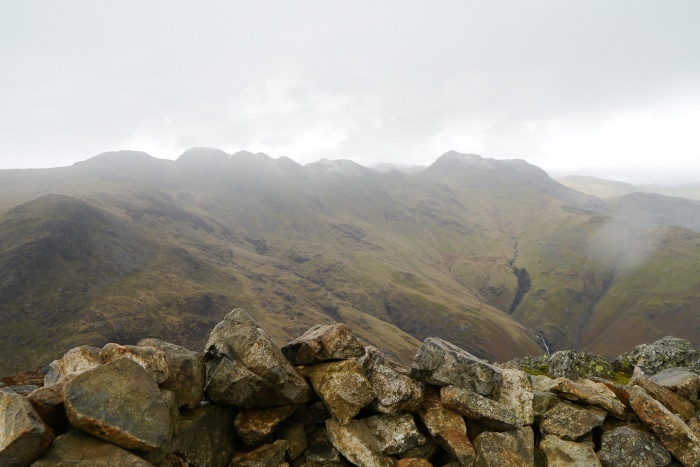 The views from the summit were limited and I noticed that the higher peaks already had a light dusting of snow. I took the main path eastwards from the summit as I thought this would be the easiest option. I did not count on a couple of scrambly sections which to be honest were a little tricky with a dog. Wet rock and a squirming hound made for slow progress. 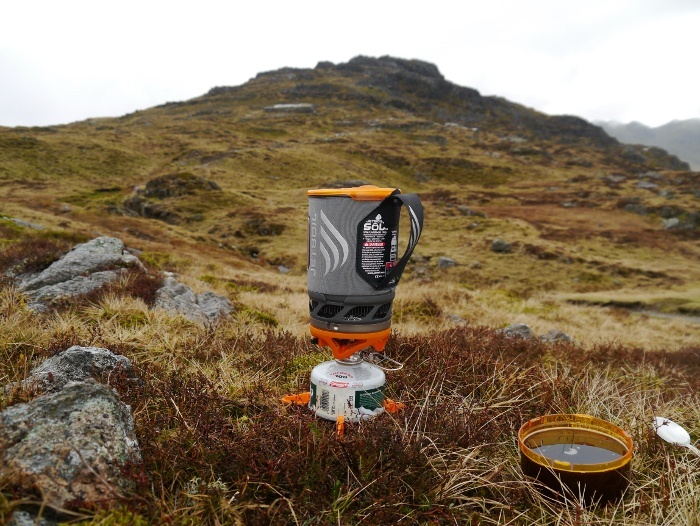 Once on safer ground the rain actually stopped so it was time for lunch and a fresh hot brew. The steep pitched path down towards Side Pike was slippery and jarring on the knees but was very effective in curbing erosion. I tried to keep focused on the rather excellent views. 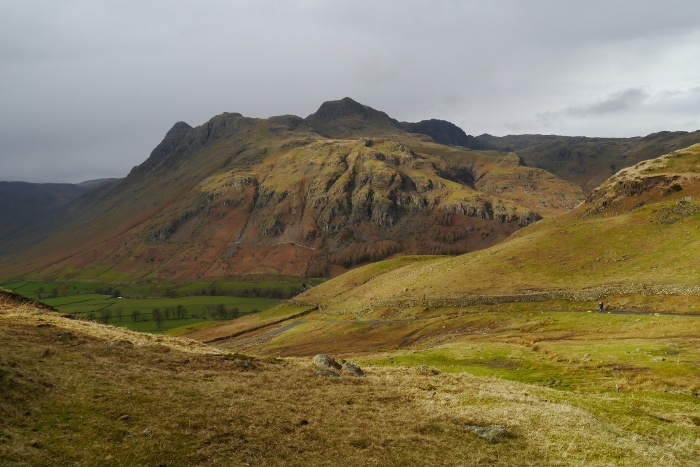 Contouring round to the summit of the road, the murk cleared from the Langdale Pikes. 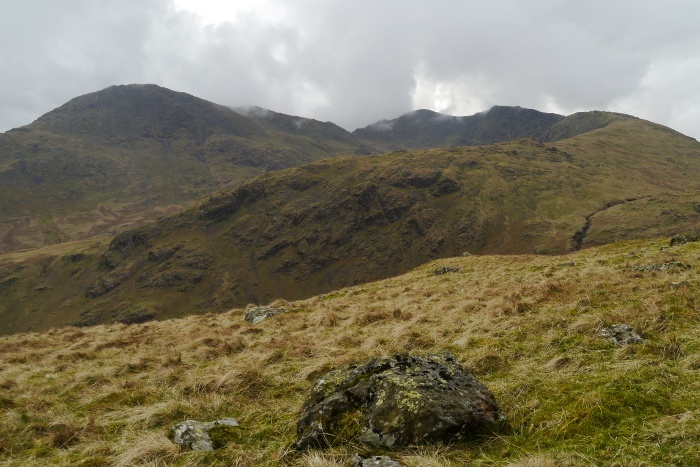 I have walked their summits a few times and have to say that they are hills to be looked at rather than climbed. 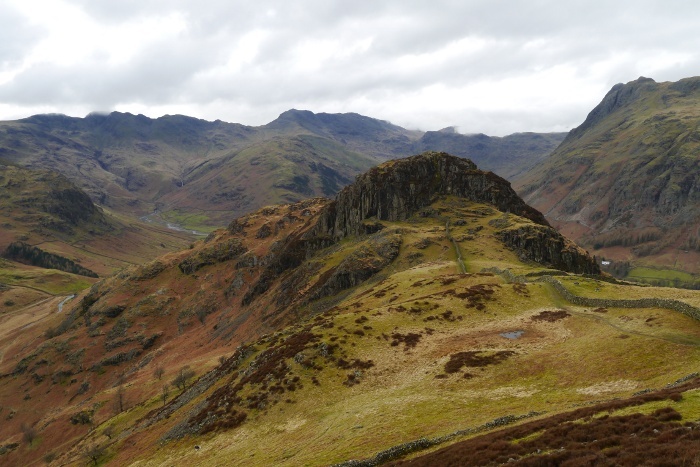 From the perspective of this side of Great Langdale they are magnificent, a complex crumpled mess of rock and deep ghylls, one of those iconic mountain views. A steep path climbed up towards Side Pike, giving a different perspective of the surrounding hills, the weather still not deciding whether to brighten up or rain. It did both. 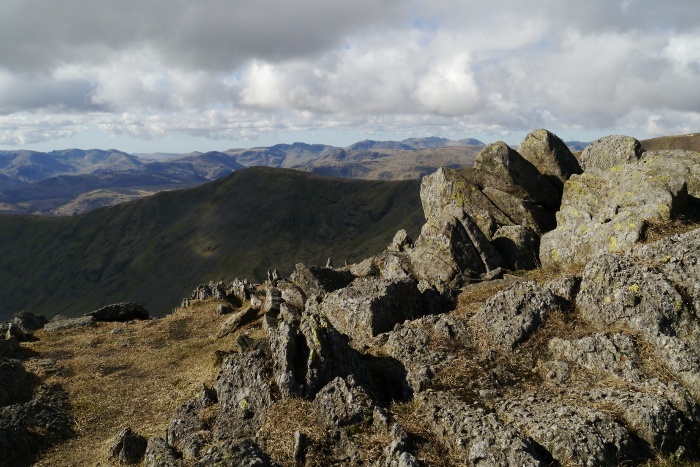 Mountain lassitude took over and I opted out of the short climb to the summit of Side Pike. 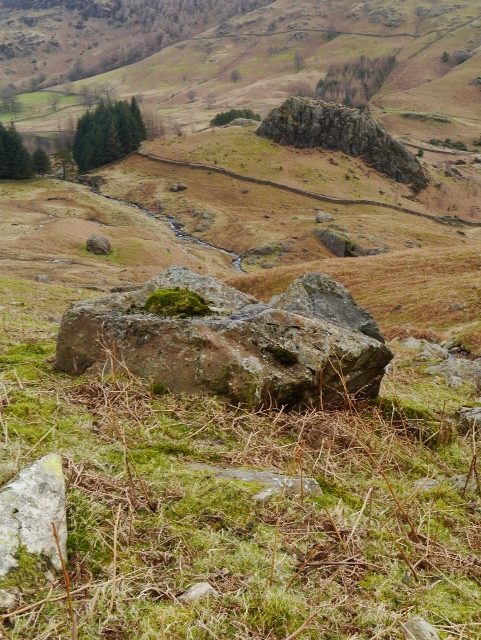 A path contoured around its rocky crown and we came to a cleft in the hillside which has to be squeezed through. Reuben initially refused to attempt this and I had to remove my rucksack and shove my ever-increasing bulk through. It took a bit of coaxing from the other side to get him through. 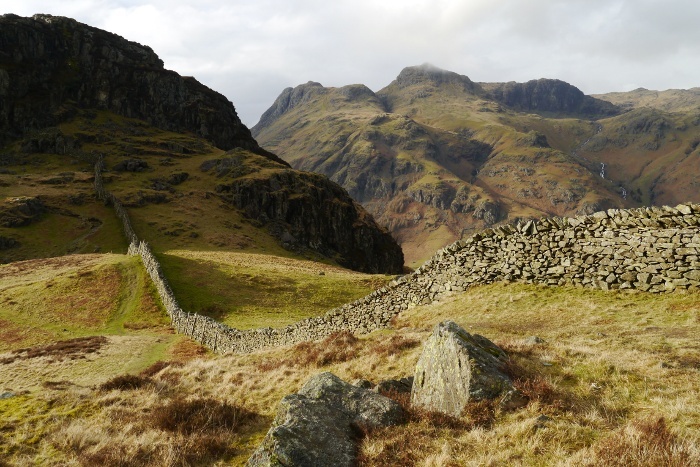 It was then a simple case of following the great wall of Lingmoor to the summit. 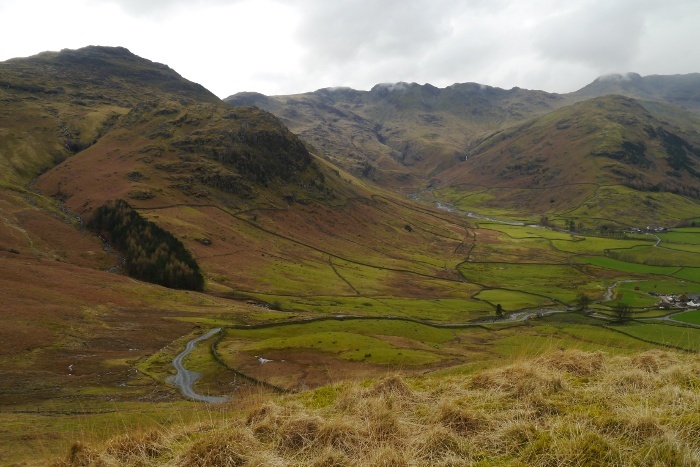 Lingmoor is a good case for biggest is not always best. 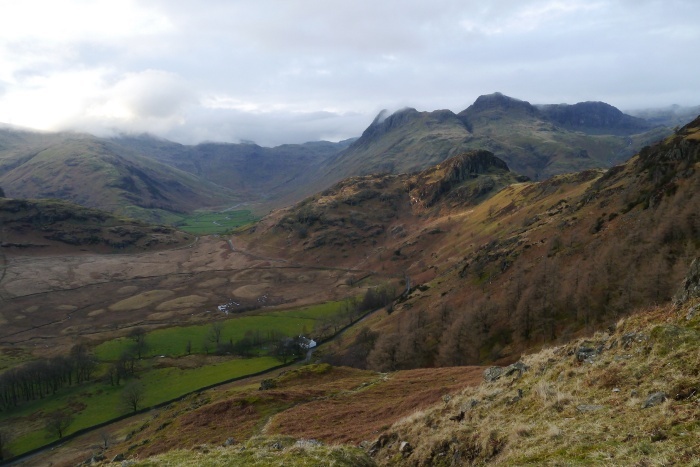 At a relatively lowly 469 metres it gives staggeringly good views right into the heart of Great Langdale. To the south low hills and forest stretch to the far horizon and I could make out the distinctive profile of the Howgills. I sat for a while whilst contemplating the view. An approaching figure looked rather familiar but I could not quite place where from. As he got to the summit cairn he asked me if I was James. I recognised his accent immediately from one of Terrybnd’s videos, it was Yuri who I had chatted with virtually under the moniker @MooShad1969 on Twitter. It’s a small old world sometimes. Reuben then did his very best at charming the pants off of Yuri’s wife, well not literally obviously. 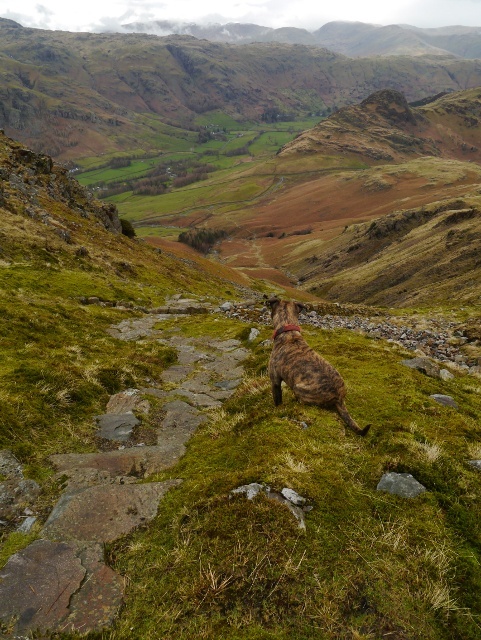 Descending the steep path to Bleatarn House I began to ponder if Lake District miles are longer than a standard mile. My legs had carried me less than 6 miles, yet I felt like I had walked double that. My knees had also started to creak. However that was soon forgotten when the light did something magical to the surrounding fells, giving them a texture of painted canvas. I returned to the van a happy man. Once again I was motoring up the A1 in horrendous weather, driving rain reducing the visibility. As usual I found myself questioning my sanity for heading into the hills in less than ideal conditions. 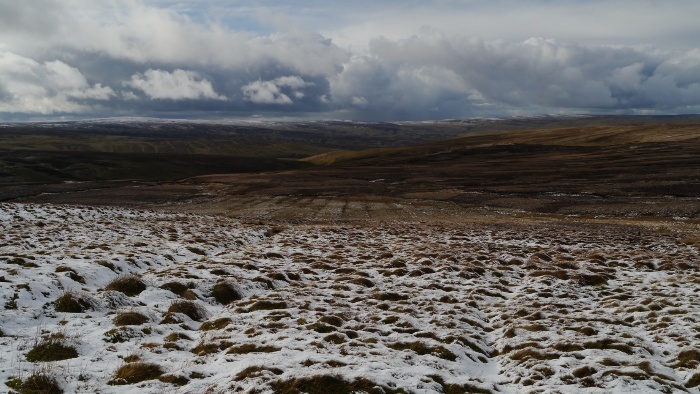 When the hills of Upper Teesdale embraced me I noticed flashes of white under the steely grey clouds. As the road twisted its way higher and higher the snow line met me just in time for a heavy snow shower to blow in. I was enveloped by a disorienting combination of white ground, swirling mists and fat snow flakes bashing the windscreen at 30mph. Thankfully the road itself remained largely snow free and I eventually pulled over just past the summit at nearly 600 metres so I could stuff my face and watch the snow fall. A car pulled up behind, it was Martin and his mate Keith. We had managed to time our separate arrivals to within a few minutes of each other. 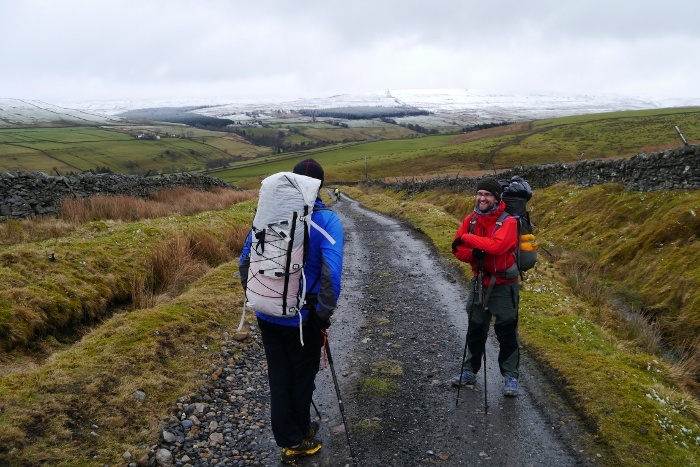 After standing around in the snow chatting for a while we set off in convoy down to the lovely village of Garrigill, tucked away in the South Tyne valley. Parked up outside a house I noticed we were being watched through both the upstairs and downstairs windows whilst we were sorting out our gear. I thought to myself that either they would keep an eye on our vehicles, or they would be annoyed and we would return to a flat tyre and scratches! Three men and a dog all kitted out with backpacking sacks then made their way up past the village green to the track that would take us onto the moors. The climb was long and steady but with good conversation and a firm surface we made quick progress. Thankfully the rain had stopped which avoided a sweaty climb in waterproof trousers, something that I am never keen on. 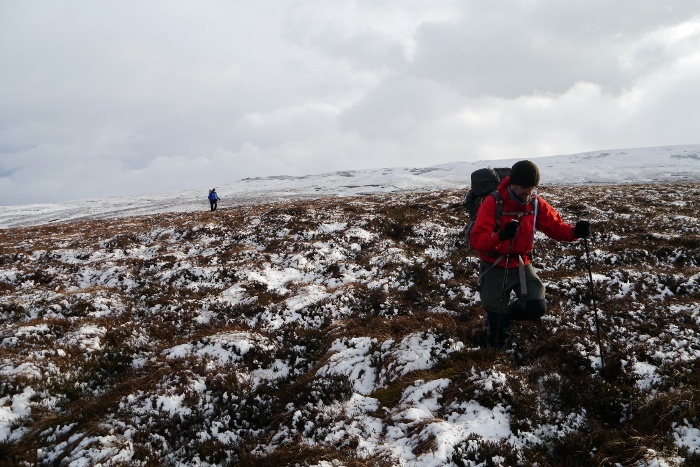 As the track levelled out on the moorland plateau we reached the snow line. With dark heavy clouds scudding just overhead it was an atmospheric place to be. Further down the track Keith made the mistake of bending down to adjust his laces. Reuben took this opportunity to sneak up so he could try to lick his face. This was very effective in knocking him off balance. Reuben is never shy about sharing his love with everyone that he meets. Snow is great to look at but can give difficult conditions under foot. 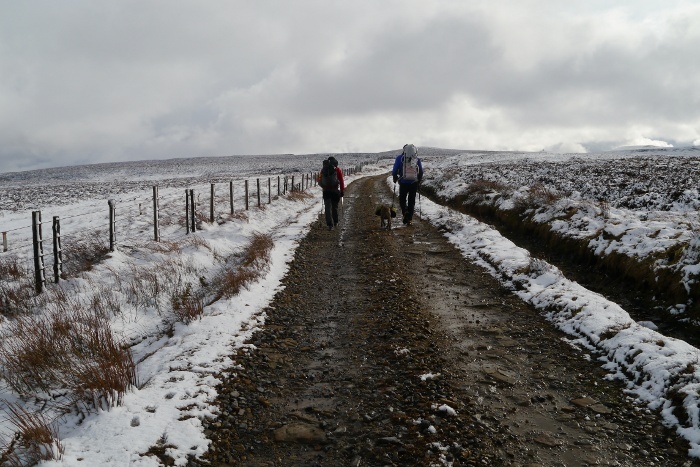 Thankfully the track was completely free of snow and most of the climbing was now behind us. 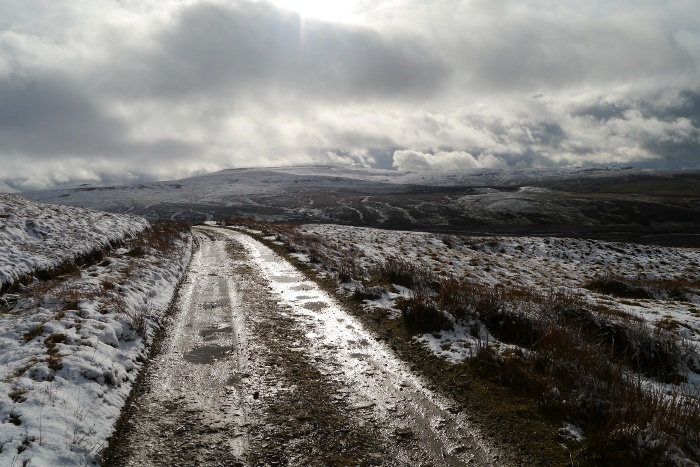 The level track took us deeper into the wild open spaces of the North Pennines, a landscape on a huge scale made all the more dramatic by this sudden brief taste of winter. Our planned home for the night was a bothy hidden deep in a secretive fold in the hills, unfortunately in a completely different direction to where the track was heading. 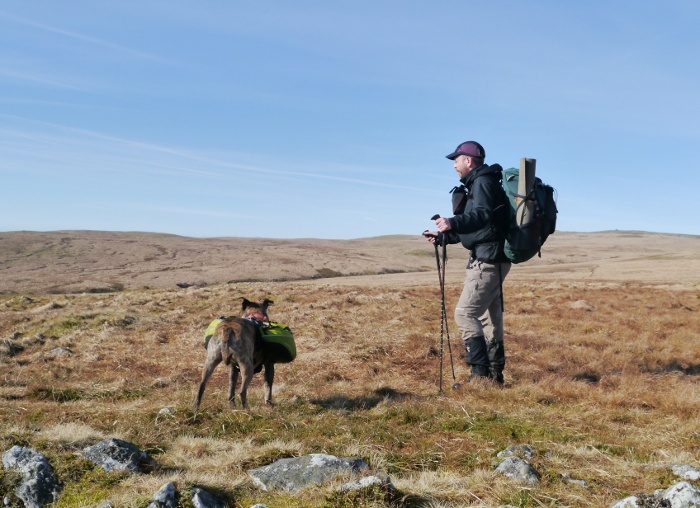 The comfort and security of the track was left behind and after crossing an infant stream we struck off across trackless ground dominated by deep heather and the occasional bog. Wet snow sitting on top of the heather made progress particularly slow and hard work, not my favourite sort of terrain to cross. With an area of limestone puncturing the surface of the moor the going became easier for a while, the heather being replaced by sheep nibbled grass. 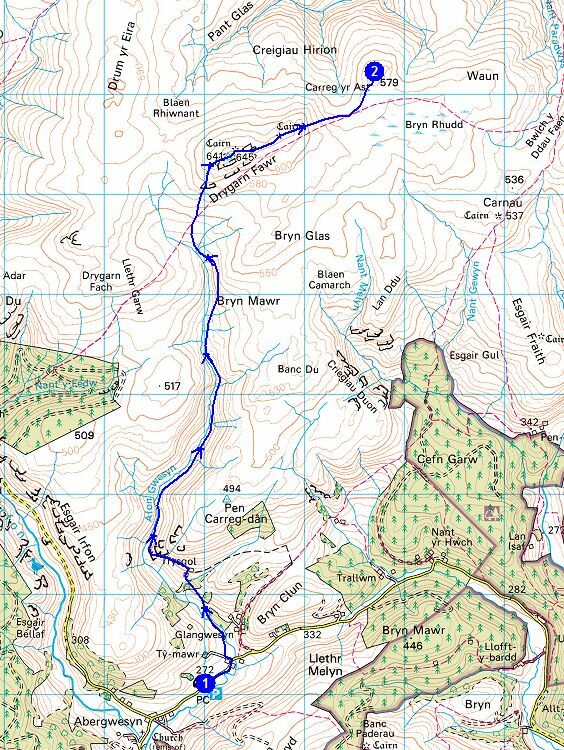 Time to relax from the lurching exertion of earlier with the knowledge that the bothy was now just a short walk downhill. It was only a few weeks since my last visit to this bothy and although I was approaching it from a different direction the area was pleasingly familiar. We followed a quad bike track skirting a series of low hills and found that it was heading directly towards the still hidden hut. The late afternoon light gave a wonderful texture to the hills, the rushes whispering in the wind and slowly dispersing clouds moving lazily overhead. The bothy was thankfully empty, something we pretty much expected late on a Sunday afternoon in March. We were glad that we had made the effort to carry in a couple of kilos of coal each as there was not a single scrap of fuel left by the previous visitors. 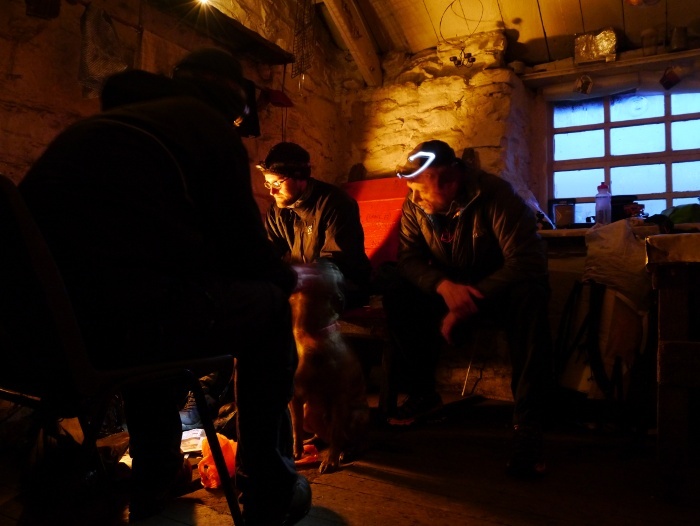 The bothy can charitably be called ‘cosy’ and the three of us, Reuben and our rucksacks filled most of the space in the small room. 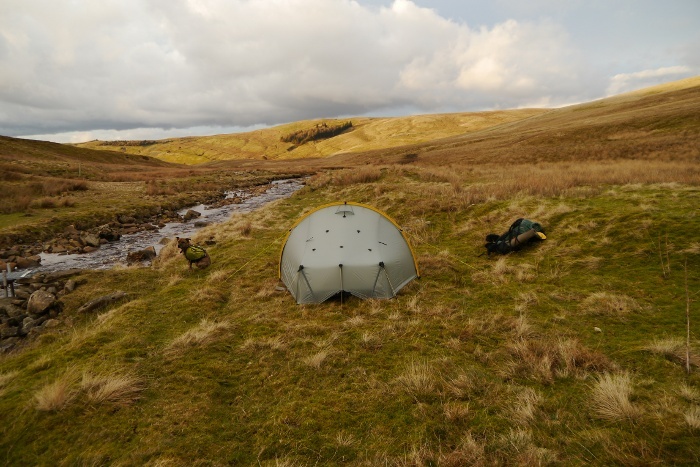 I had brought my Scarp1 tent along and decided to pitch it outside. 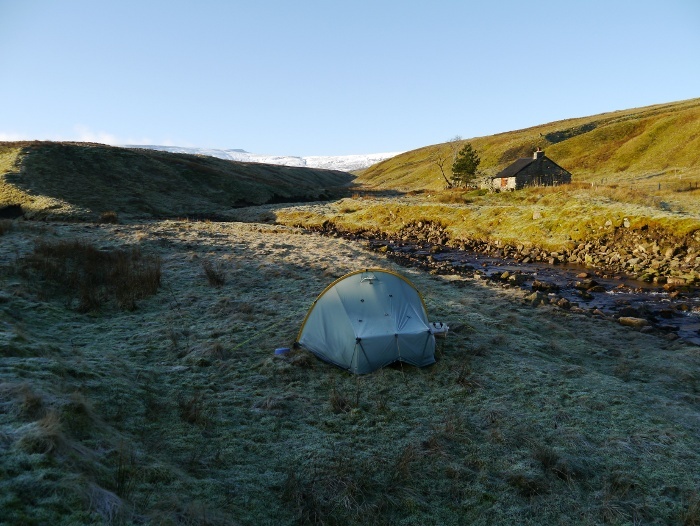 If we had all slept in the bothy we would probably have had to of engaged in some synchronised spooning, something that I was not particularly keen on! Outside I was disappointed to note that every single flat bit of ground had been ruined by inconsiderate moles leaving piles of earth. The small patches suitable for a pitch were covered in thistles hidden in the lush grass. Thankfully there was a mole hill and thistle free patch on the other side of the river and I pitched the Scarp1 with excellent views down the valley. The bridge across the river is a DIY scaffolding affair with a metal lattice surface, as impossible for a dog to cross as a cattle grid. 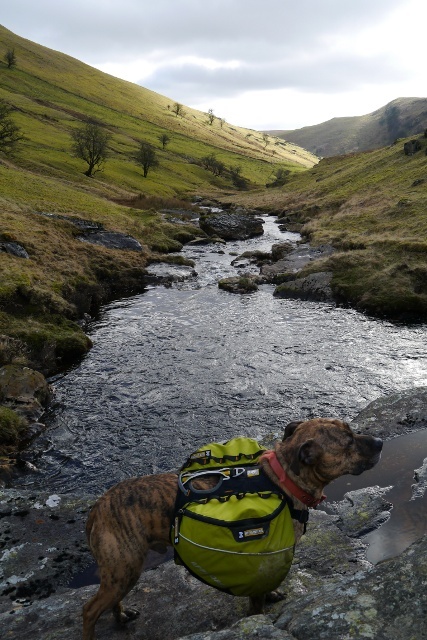 Poor old Reuben had the indignity of being carried across squirming in his harness, clearly not keen on being hoisted high above the river. 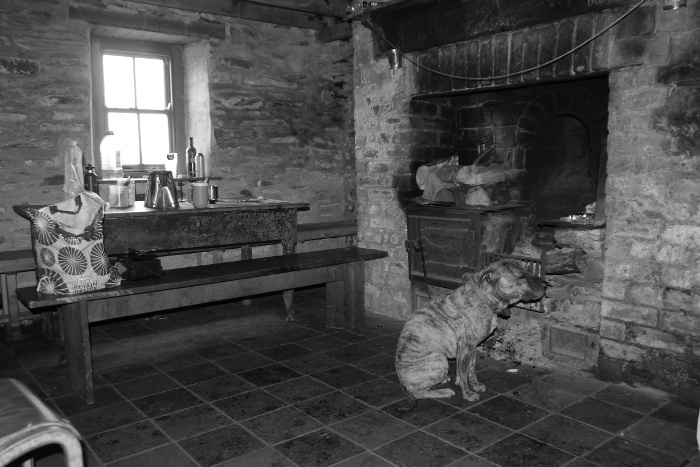 I returned to the bothy with Reuben for an excellent evening of eating and drinking in front of the fire. Once the coal was burning brightly the room soon heated up and Reuben was quick to bag a spot as close as possible. 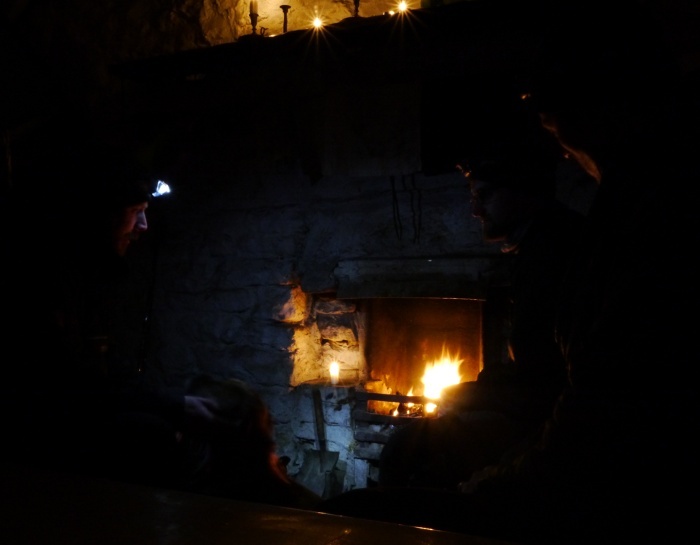 Bothy nights are much more preferable to being in individual tents when backpacking as a group, especially in winter. With space to relax and be sociable it is easy to put the world to rights in front of a bothy fire. Keith removed a special treat from his rucksack later in the evening, a box of premium sausages for him and Martin and a box of veggie ones for me. 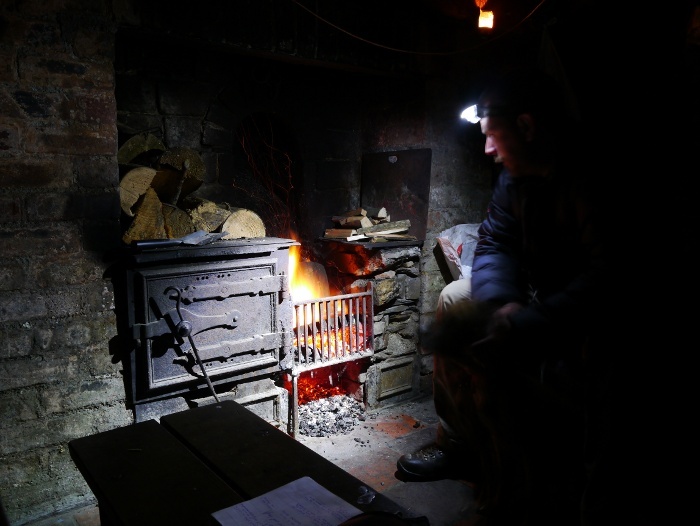 With the fire kicking out the heat he set about frying them over the open flame, the bothy soon filling once again with the welcoming scent of food. 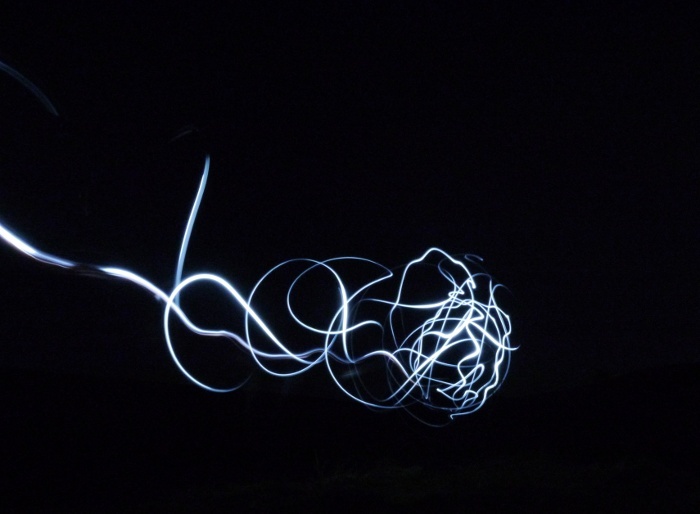 With the sausages sizzling away, myself and Martin took ourselves outside to experiment taking night shots with our respective new cameras. I have to admit that I particularly enjoyed running around whilst wildly spinning a torch in my hands, quickly getting giddy and breathless. All the flashing of lights must have been pretty conspicuous as after a short while an estate vehicle came down the track before returning across the dark moor. It may have been coincidence or they may have wanted to check out what was going on. Play time was soon over when we were called back in for bothy cooked sausages. 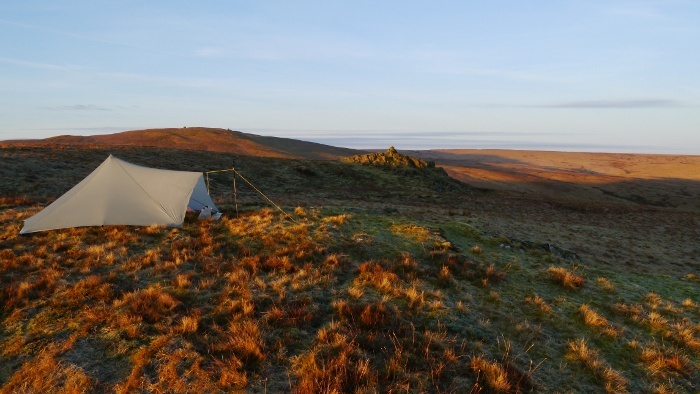 Later as I left the bothy to retire to my tent with Reuben the grass under foot was crunchy with frost. The crossing of the slippery bridge was tricky in the dark whilst carrying a squirming dog and I was pleased to get across without incident. 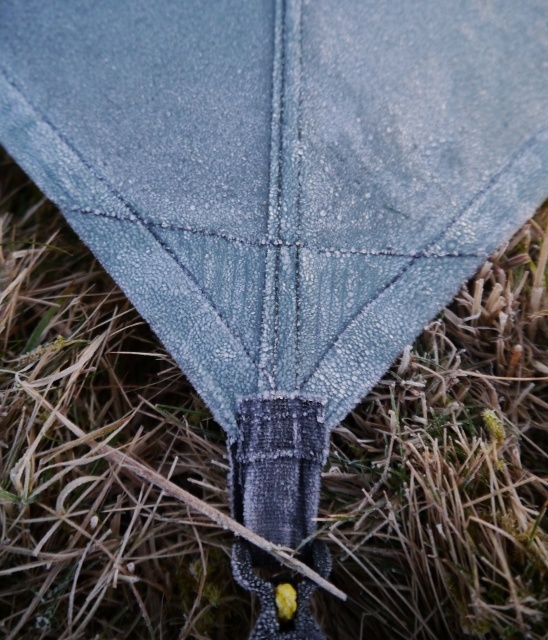 The fly of the tent was stiff with ice as I unzipped it to deposit the rest of my gear inside. 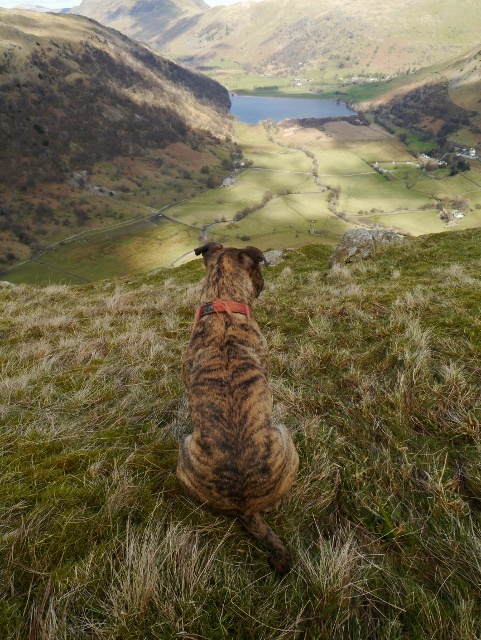 Reuben decided that he would much rather be back in the nice cosy bothy and proceeded to sneak off to sit forlornly next to the bridge he was unable to cross. Despite the cold it was a fantastic night for star-gazing, the earlier clouds having departed to leave a crisp star filled sky. I could clearly make out the shapes of the surrounding hills, the higher peaks covered in snow. Wrapped up in my down jacket I enjoyed messing around with my camera attempting some night shots. It is only now I wonder how I would have appeared that night to the casual observer? 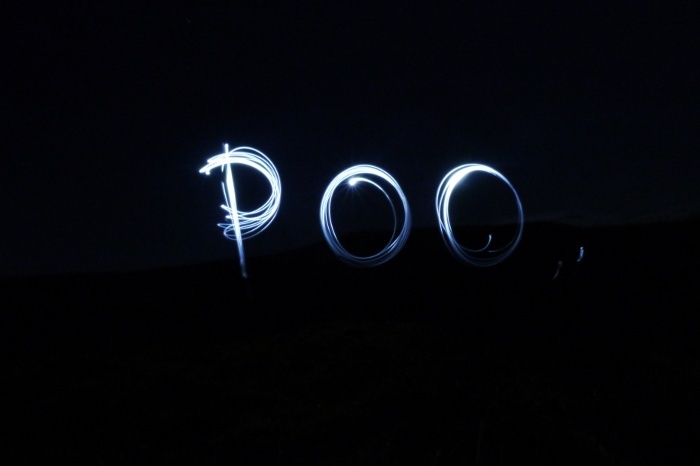 It was then with great excitement that I discovered the ability to write using the beam from my torch. Unfortunately my inner child took over and I produced some far from mature pieces of work. This is the only one that I can safely publish on my blog without causing offence! Actually I did spend a great deal of time attempting to write the word ‘Blog’ but was unsuccessful time after time. You have to do mirror writing and my brain failed on each attempt to get the letter g the right way round. I now have clearly defined aims and objectives for my next wild camping trip. 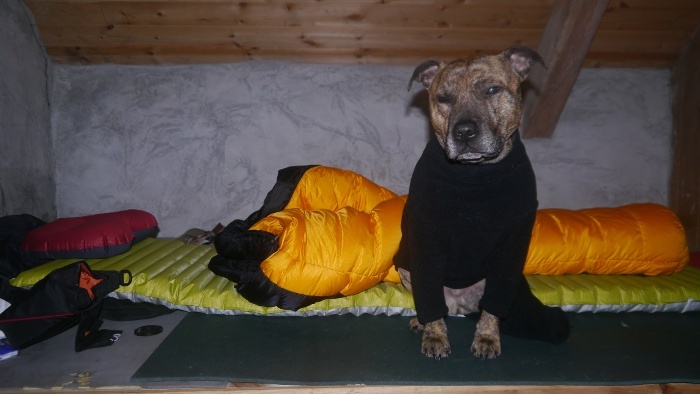 The night was cold and I did not remove my down jacket after getting in my sleeping bag. Reuben snuggled up close wearing his fleece nightwear and with the luxury of both a foam mat and blanket to lay on. I woke up just as the sun was flooding the valley with light. Sitting up in the Scarp1 I got an impromptu shower as I brushed my head on the inner, the long cold and still night had let to copious condensation. I was quick to exit, moving about to warm myself up. 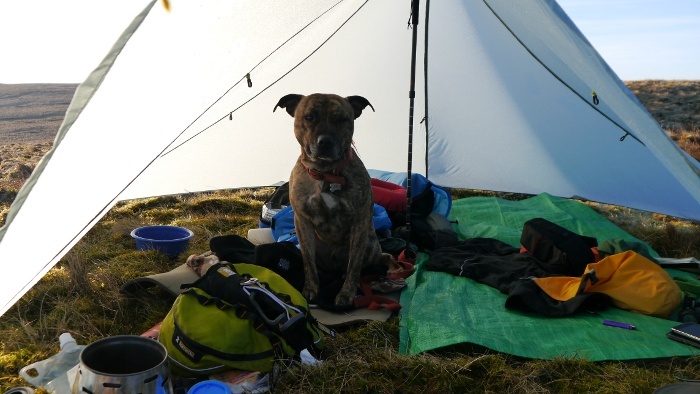 Reuben however was more than happy to remain in the tent, the first rays hitting it providing a small amount of warmth. 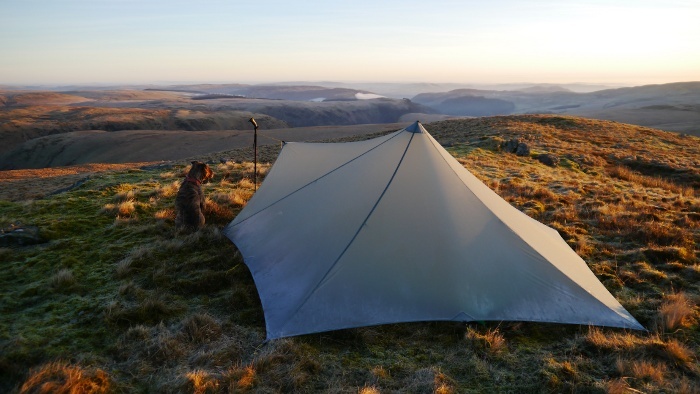 It was one of those perfect wild camping mornings and I spent a couple of hours relaxing in and around the tent, brewing up and eating breakfast. I did not want to unnecessarily put Reuben though the bridge ordeal so I did not return to the bothy to be sociable. It was good to simply be outside. 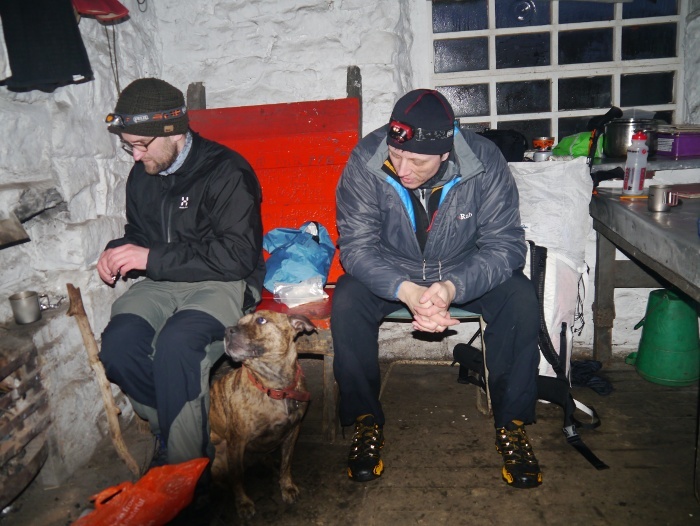 As I was packing up Martin and Keith left the bothy and came over for a chat. They were on their way onto the high hills where they would seek out a wild camp later that evening. However I had to return to work the following day so we went our separate ways. You can read Martins account of their trip here. 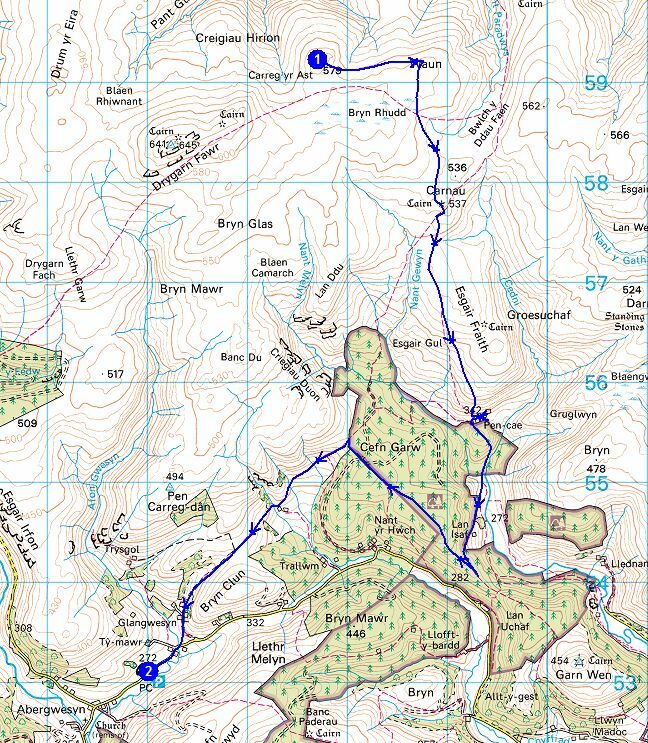 Rather than retrace my steps back to the car I decided to try to cobble together a circular route taking in a waterfall I have long wanted to visit. Walking down the valley next to the river a quad bike approached, its driver clad in camouflage. I got a quick flutter of nervousness as I was just inside a doggie exclusion zone due to the area being a grouse moor. Thankfully he simply gave me a wave and drove on past without stopping. The waterfall itself was tucked away in a little visited side valley and I would imagine it gets few visitors. It was a slippery scramble down to the base of the falls but worthy of the detour. After crossing the river and a steep climb, a great little path contoured the hillside giving panoramic views down the valley. 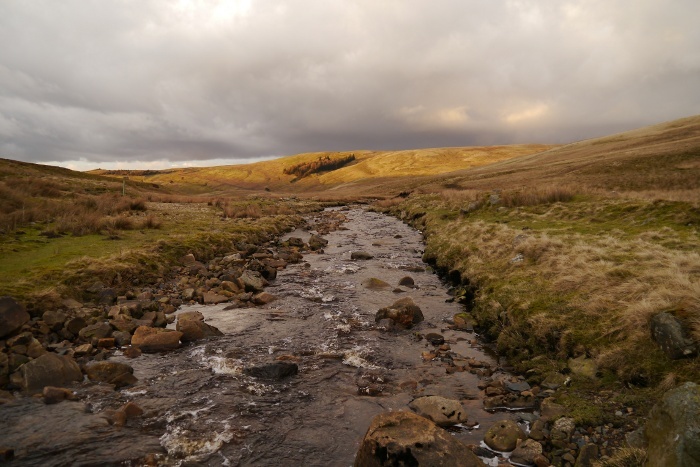 I spotted plenty of promising wild camping spots next to the river as it snaked its way downhill, a valley to return to I think. The view from one spot especially reminded me of the Monadhliath, high and wild moors stretching off as far as the eye could see. A truly wonderful spot. The dilapidated farm buildings had been watching over us from a distance whilst we were at the bothy. 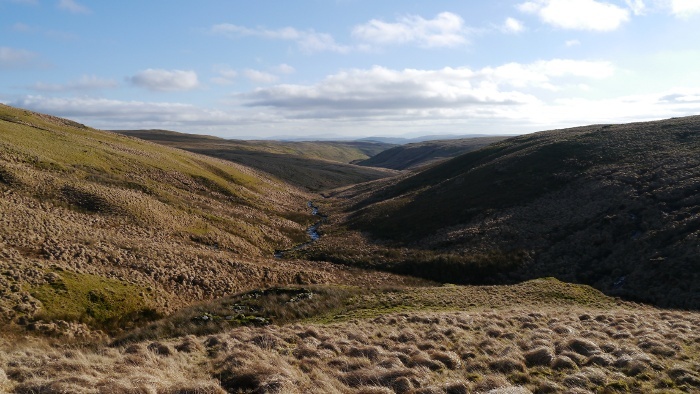 On closer inspection they occupy a perfect location in terms of a view, high above a river leading into the heart of the North Pennines. The isolation and harsh weather conditions however must have been its downfall and the numerous buildings were in a sorry state of repair. If I came into some money I would love to be able to restore the place to its former glory. I did however enjoy the scene of dereliction and melancholia. 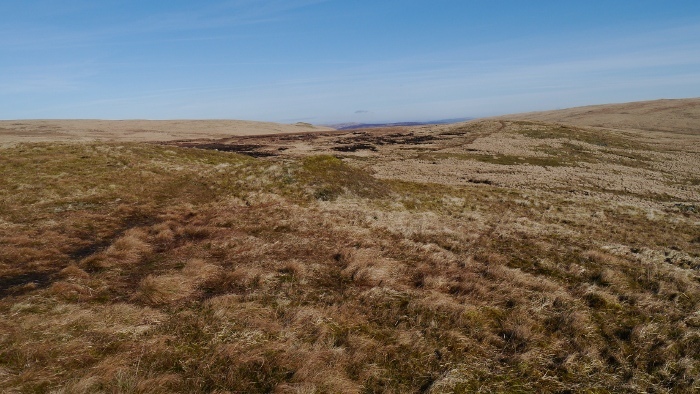 The map showed that the moor was trackless so I was happy to follow a narrow grassy trod through the grass up to the nearby trig point. The earlier taste of spring was blown away on a cold wind, the higher surrounding hills still covered in their mantle of white. The unmarked path continued for another mile of so across what would have otherwise been difficult ground. The views north into Northumberland appeared unlimited in the clear air. I was soon back on the track I had walked up the previous day and out of the wind it felt like spring once more, the whitewashed cottages across the valley giving it a homely appearance. In the sunshine Garrigill appeared as a perfect English country village, sheltered from the austere moors above. 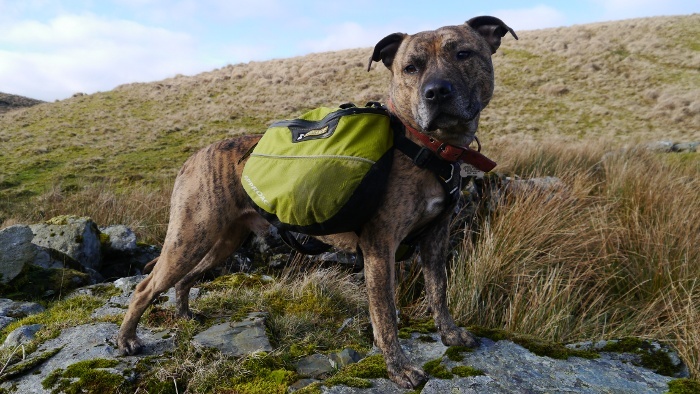 Reuben caused a few raised eyebrows and comments with his pack. One woman being particularly impressed that he had carried his own gear for a night on the hills. It was with some sadness that I drove home. Whilst I was sorting out my gear in the empty car park in Abergwesyn the weather was changing fast. The day of blue skies and warm sunshine quickly replaced by grey cloud and a cold wind. 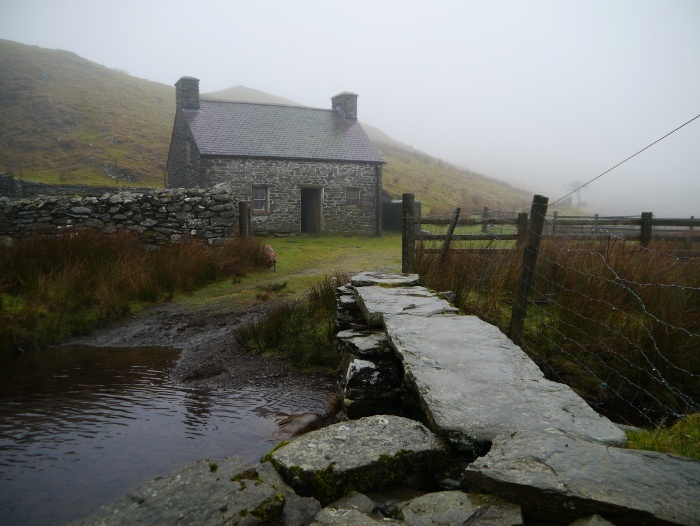 I originally had the idea of visiting the nearby MBA bothy at Moel Prysgau to check out the recent renovations. However it is a fairly lengthy walk in from the road with several river crossings. Outdoor lassitude was setting in and I decided instead to visit a lovely little bothy which would involve almost no physical effort at all. The road from Abergwesyn to Tregaron has always held a fascination for me when looking at my ordnance survey maps. A narrow yellow line squiggles for miles across an empty landscape, hair pin bends marked with little arrows that indicate steepness. When a section of road is named the ‘Devil’s staircase’ it is probably worthy of further exploration. 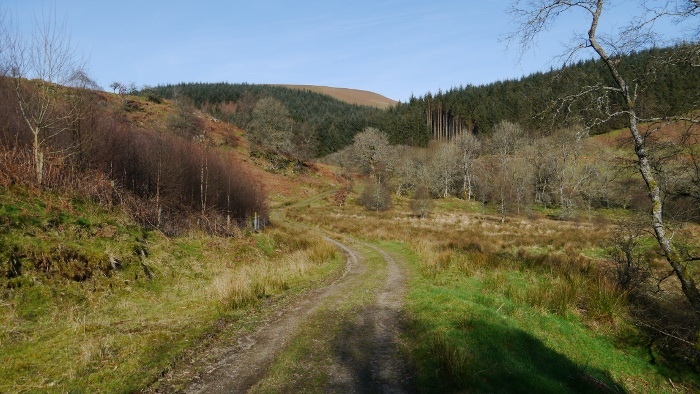 Climbing into the Irfon valley is like entering a hidden secret world after the pastoral landscape around Abergwesyn. It is a sublime spot and the narrow single track road that runs through its length is a joy to drive. A place to return to for a spot of ‘Bongo wild camping’ I think. The Devil’s staircase was as steep as the map suggests and I made the mistake of giving way to a car coming downhill on a particularly vertical section. The combination of gravity exerting its force and the inappropriate use of the clutch led to a nasty wheel spin as I continued uphill. I would highly recommend avoiding this road when there is even a hint of winter conditions. 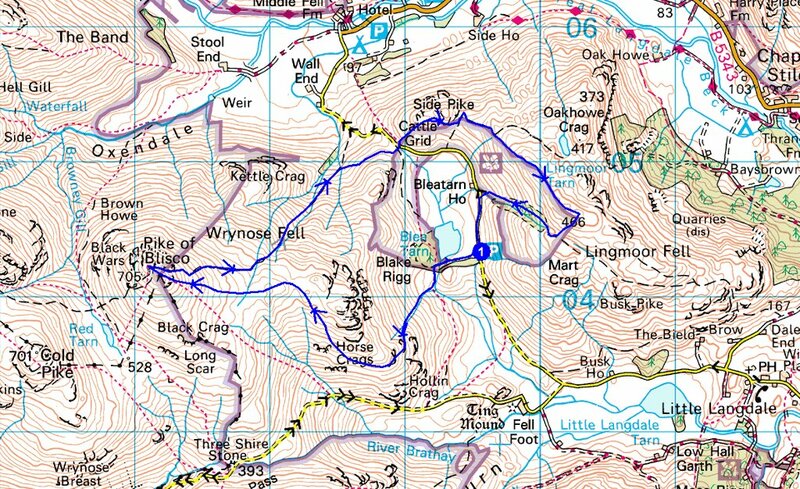 Twenty miles of delightfully twisty single track lanes brought me within striking distance of the bothy. I have to admit that my heart then sank. It was a Sunday evening, close to getting dark on a remote moorland road in Mid-Wales and two vehicles were parked in ‘my spot’. I have to admit that I selfishly cursed them as I really fancied spending the night in the bothy alone! I Parked nearby and thought about what to do next as two cars could mean a busy bothy. 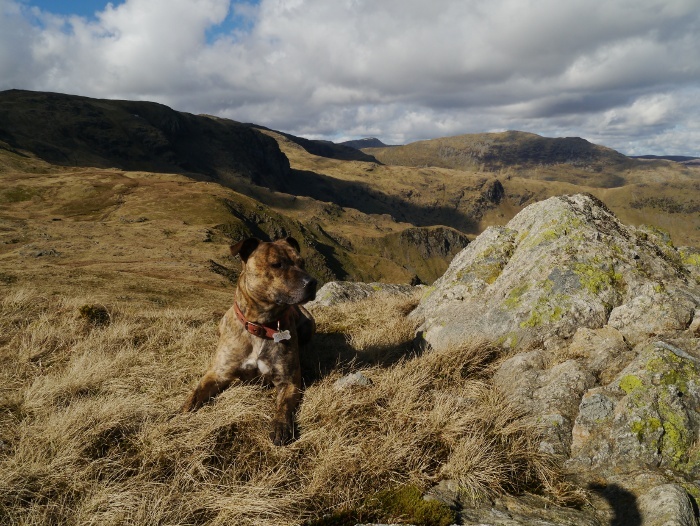 In the end I decided to leave Reuben in the car and have a brisk walk down to the bothy on a scouting mission, at most it is only 15 minutes walk from the car. Half way down the hill I was greeted by a trio of English Setters and their owners making their way up to their parked cars. They confirmed that the place was empty so I walked back up to the road with them. When I returned to the car Reuben was looking forlorn and abandoned. 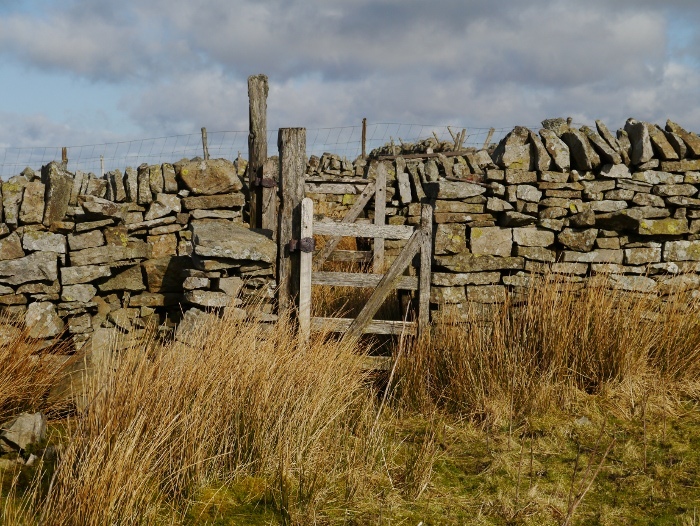 With a rucksack full of bothy luxuries and five kilos of coal in one hand and five kilos of wood in the other I tottered off back down the boggy track. The familiar outline of the cosy little building soon came into view, nestled into its little fold in the grassy hills, the mist descending to cover the tops. It had been a few years since I last visited and upon entry I was pleased to see that the place was still tidy and well cared for. 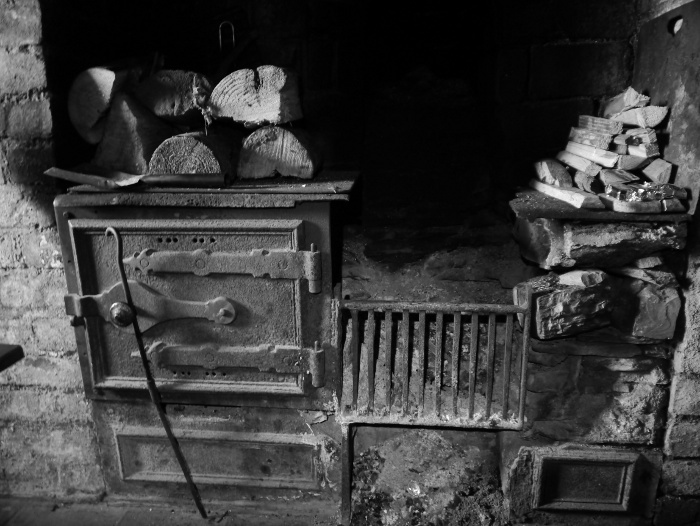 The fireplace was stacked with cut logs and kindling, something I always try to reciprocate when leaving a bothy for the next person. Exploring outside I noticed that the wood shed was piled with logs provided by a local sawmill and that the proper loo was still present and in working order! A perfect bothy evening passed eating copious amounts of food and reading post apocalyptic fiction in front of a roaring fire. In fact it got so hot that I stripped down to my baselayer, a feeling that my trousers may suddenly combust in the heat. 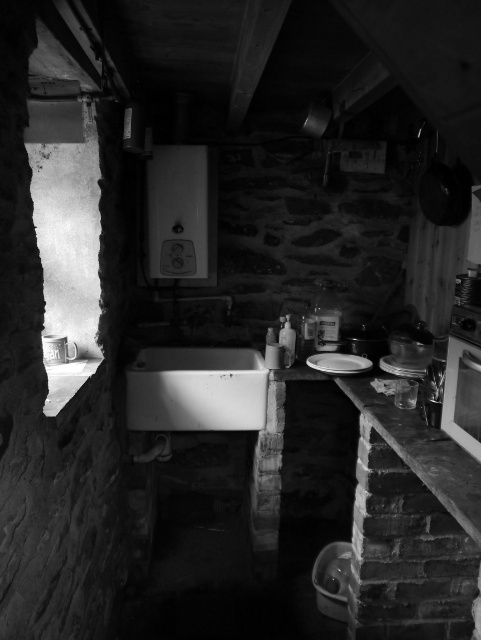 I have to admit to the fact I can sometimes be a bit of a bothy coward and am easily spooked when I am on my own in a remote and creaky building on the moors. 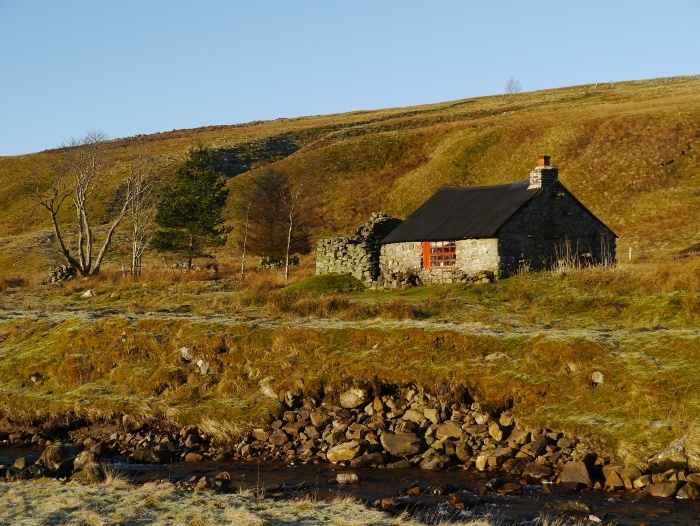 On my first ever visit to this bothy I found the hairs suddenly stand up on the back of my neck whilst cooking dinner and I fled soon after dark to pitch my tent outside. Not really rational behaviour for an adult! I have since returned and spent a night here with friends and even tolerated another group with a man who insisted whipping out his harmonica out at every opportunity. I was determined not to flee to the car this time. I am pleased to report that nothing went bump in the night. However Reuben was not very happy about being downstairs and refused to settle until we bedded down for the night upstairs. 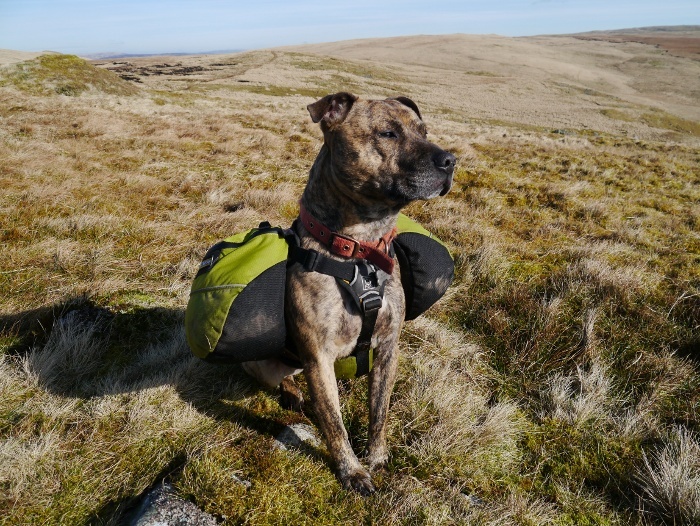 It was great laying in my sleeping bag listening to the wind blowing across the roof, the sound of soft rain on the window and Reuben contentedly snoring next to me. Looking out of the window first thing in the morning I was greeted by swirling mists, the surrounding hills submerged in the murk. However my spirits were high as it was Monday morning and I was not getting up for work. Although I did not manage to transfer my enthusiasm to Reuben who was decidedly on the sulky side. I resisted relighting the fire and set about making breakfast and then tidying up, wrapped in my down jacket to ward off the damp chill. I had not managed to get through all the fuel I had carried in so some nice dried logs, kindling and firelighters were left for the next person. I probably should mention that the bothy is a five-star establishment. It is kitted out with gas lighting, although the mantles are long gone, unable to withstand the clumsy attempts at lighting by previous visitors. A gas-powered oven, a boiler for hot water and a gas heater complete the home comforts. However I am suspicious of such contraptions and left them well alone! A couple of hours of slow faffing and it was time to set off into the mist. Reubens sulk soon disappeared once outside and we set off back up the track towards the car. I find the nearby collection of lakes particularly attractive, especially on a sunny summer’s day with the moorland birds singing overhead. However they were bleak with low cloud just skimming over the rocky knolls that separate them. 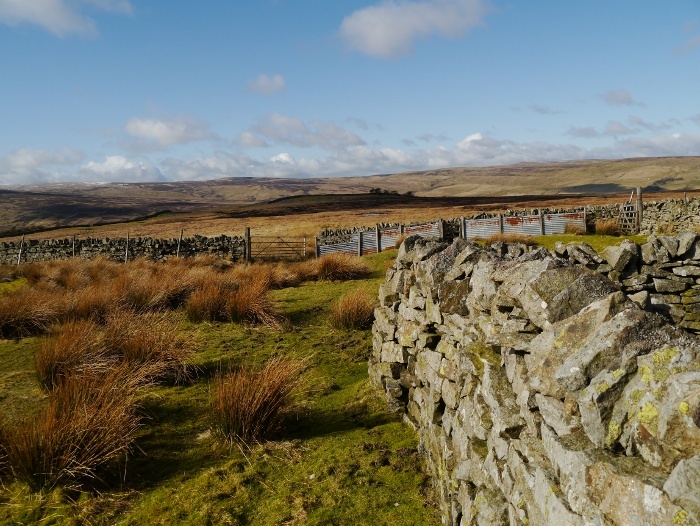 I decided against a walk around them and instead headed back to the car waiting for me on the isolated mountain road, the Mid-Wales moors rolling off to the far horizon. I had spent the whole week in lethargic indecision about the weekend backpacking route. The weather forecast was changing quicker than I could keep pace with and I was struggling to decide where to go. All I knew was I fancied a night in the Trailstar and a night in a bothy. I wanted wildness and isolation without too much effort. 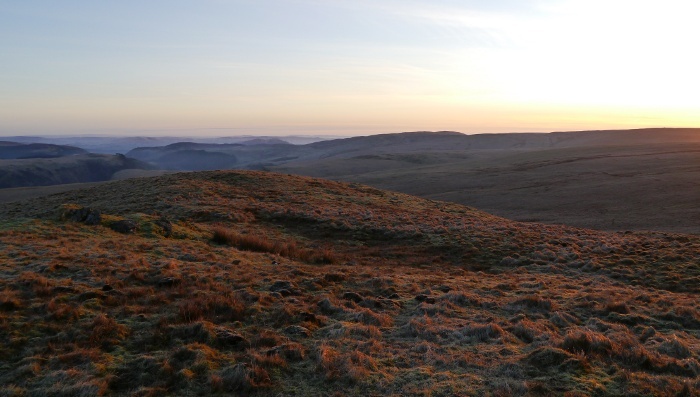 In the end I decided to head to the Abergwesyn Common in Mid Wales with just the bare bones of a route and make it up as I went along. 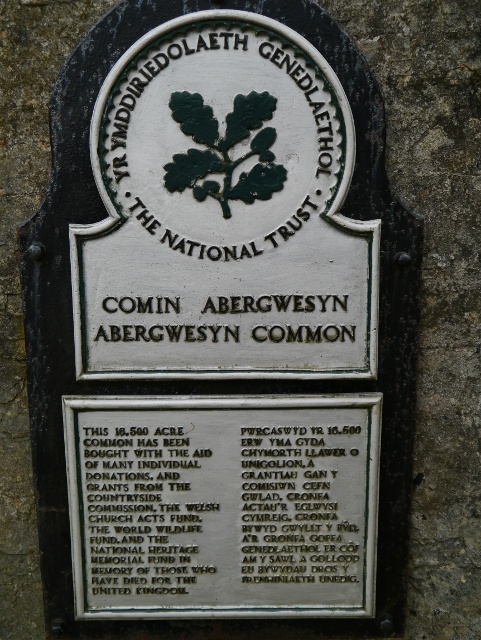 Hands up who has heard of the Abergwesyn Common? 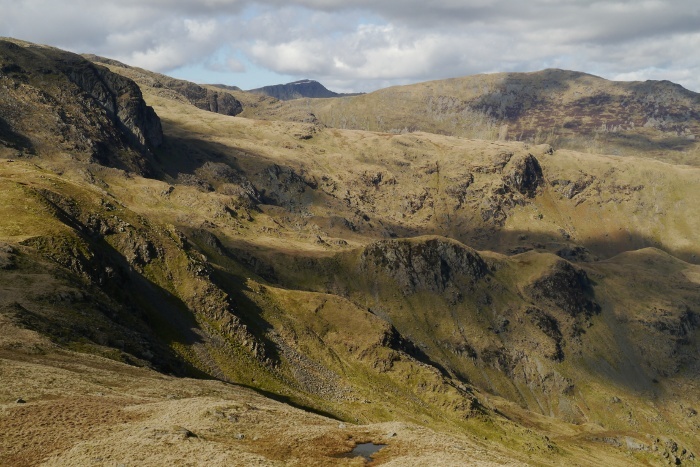 If you are a hill walker who loves the rough stuff and solitude in large measures I urge you to make a visit. 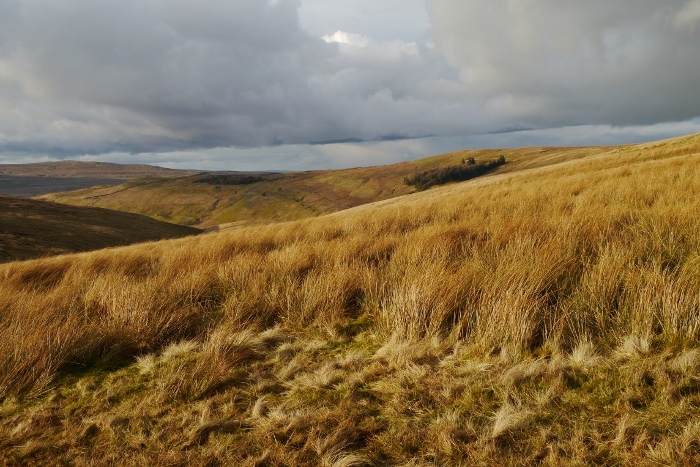 South of the Elan Valley the moors rise up and break the two thousand foot contour, the acres of tussock grass interspersed by long and lonely valleys. 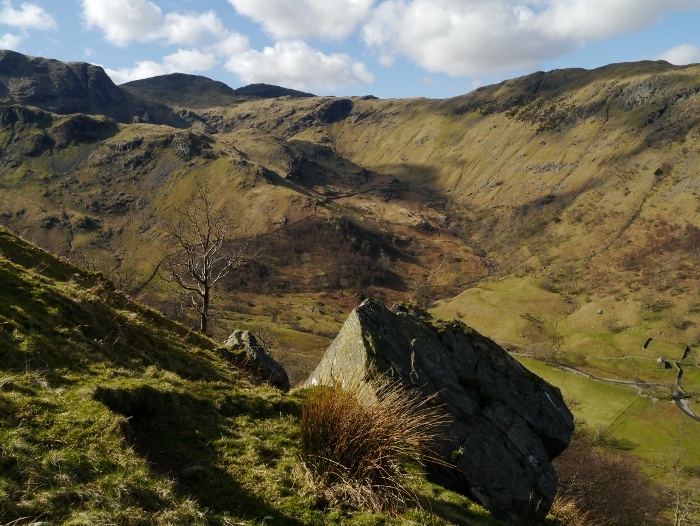 The 16,500 acre common stretches for 12 miles, a truly splendid place. Thankfully it is in the hands of the National Trust, protecting it from the scourge of the forestry blanketing the area at the time of purchase. Hopefully it will remain free from the pressures currently being placed on our diminishing wild places. I arrived in the hamlet of Abergwesyn after a long patience sapping drive along the A44 where the pace of life rarely goes over 30 mph. There is an off-road car park and public toilets, very convenient considering how remote and sparsely populated the area is. 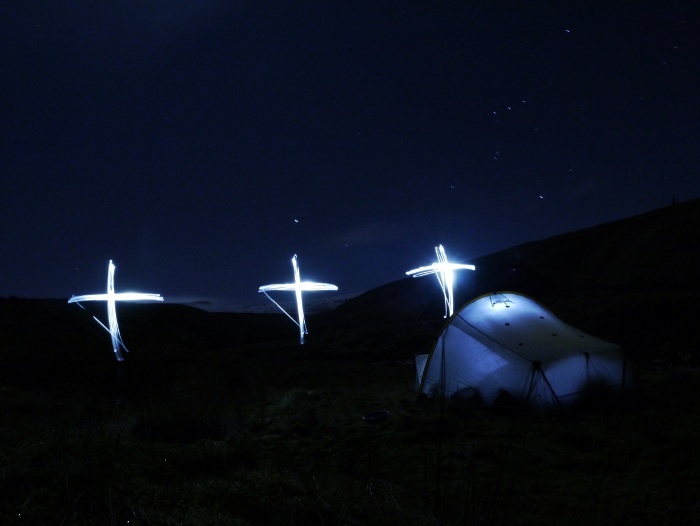 In the end I had decided to spend a night in the hills wild camping and then return to the car. I would then drive the following day to within striking distance of a bothy and haul in a large supply of logs and coal. 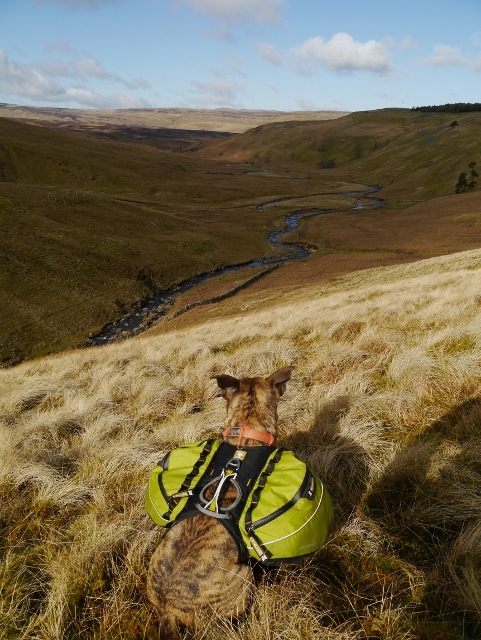 After sorting mine and Reubens gear for a night out we were soon setting off back down the lane to pick up the bridleway into the rugged Afon Gwesyn. We passed a man with what I assume was his young daughter, wide-eyed at the sight of Reuben hauling his own gear. They were the last people I would see until the following afternoon. I regretted not noticing the word ‘ford’ on the map when we were suddenly presented with a wide river that needed crossing. I decided to use the ‘run across before water can soak through the gaiters’ technique, which actually worked on this occasion. Reuben used the sniff around for ages before slowly ambling across technique. Climbing out of the woods I got a first glimpse of the long and lonely valley. For me there is something undeniably attractive about following a remote valley to its source. I love the subtle changes along its course, from the homely and pastoral to a rugged middle and then the open expanse of the headwaters. The Afon Gwesyn is this respect did not disappoint and after leaving the last of civilisation behind we came across a series of cascades, with rocks to sit and ponder the surroundings. There is not a footpath as such through the valley but a series of sheeptrods often running parallel to each other. The middle section was grassy and easy going and I ambled along stopping often to watch the numerous red kites circling overhead. 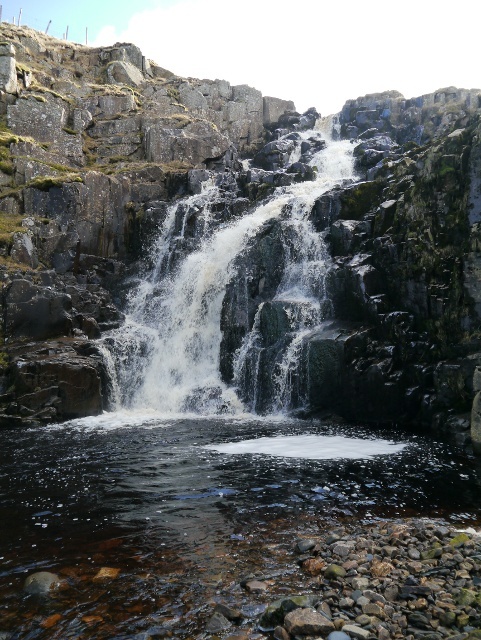 A spectacular cascade was the last final barrier to the uplands proper and it was a stiff climb alongside its tumbling waters. 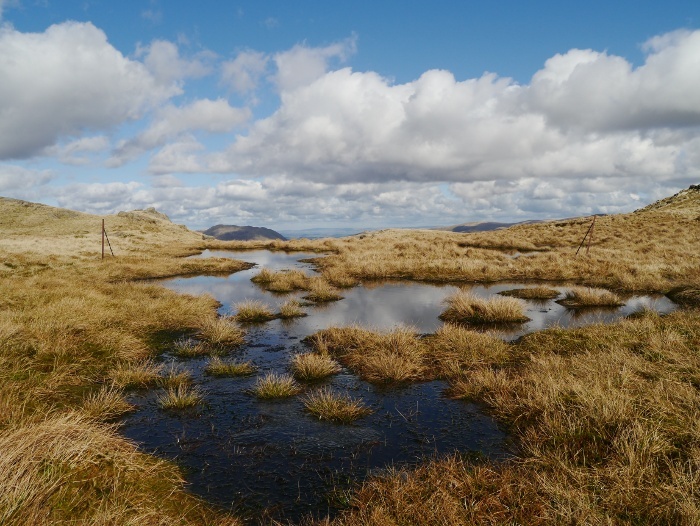 Above was a different world of bog and tussock, the going tough with sketchy paths simply leading into oozing bogs. 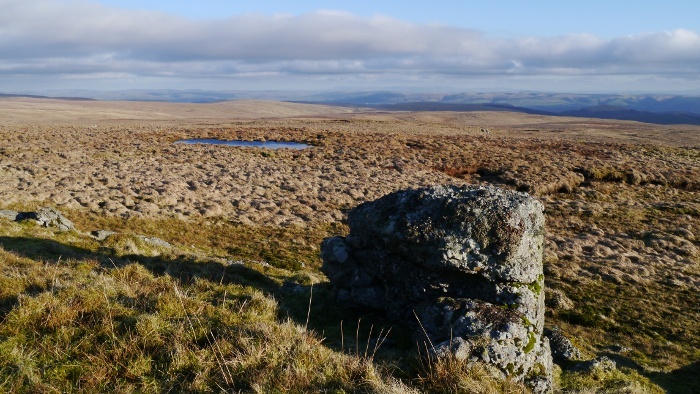 It reminded me of parts of northern Dartmoor but without the tors puncturing the skyline. Where the headwaters split, a moss-covered wall gave me a place to sit and eat my lunch whilst Reuben looked on with a hungry look in his eye. 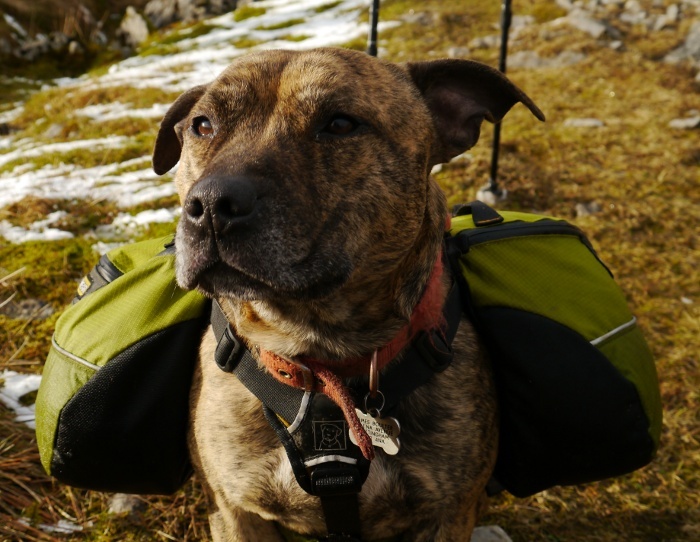 Little did he realise that his own dinner was so close having been stored in his backpack. 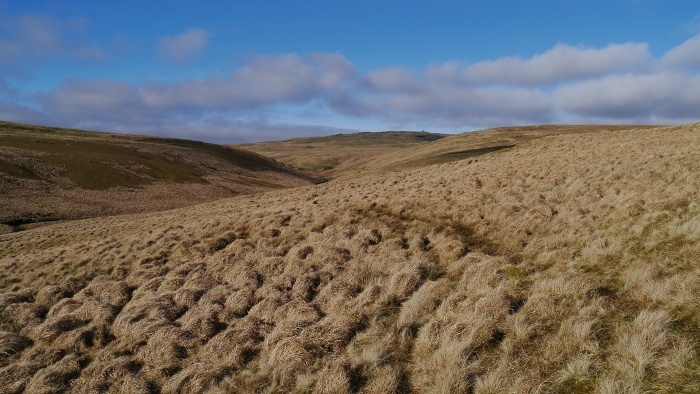 After the boggy tussocks of the valley the slopes up to the summit of Drygarn Fawr were easy going on mostly firm dry grass. 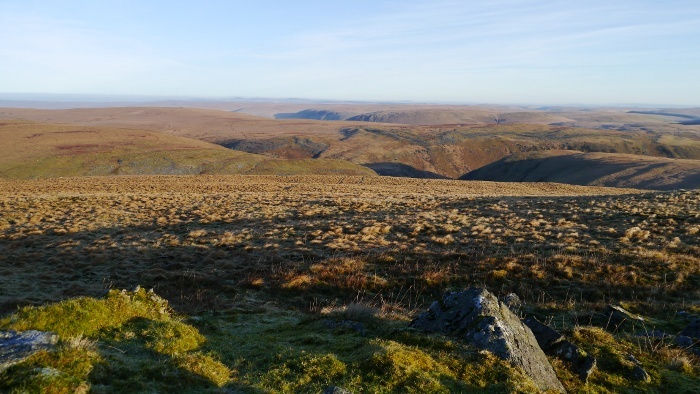 The view to the south was spectacular, the snaking line of the valley leading the eye to the Brecon Beacons on the far horizon. 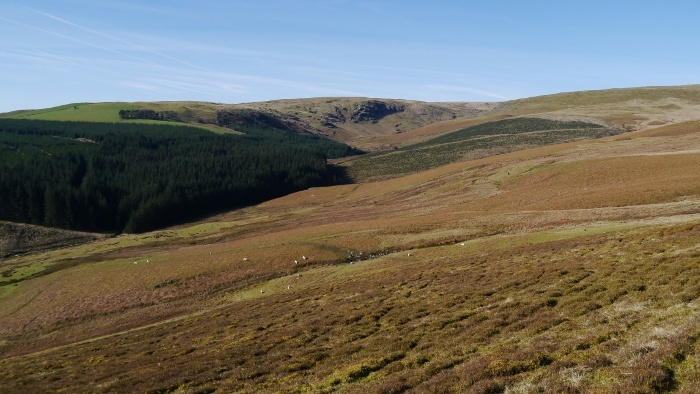 This is wild and remote mid Wales at its best. 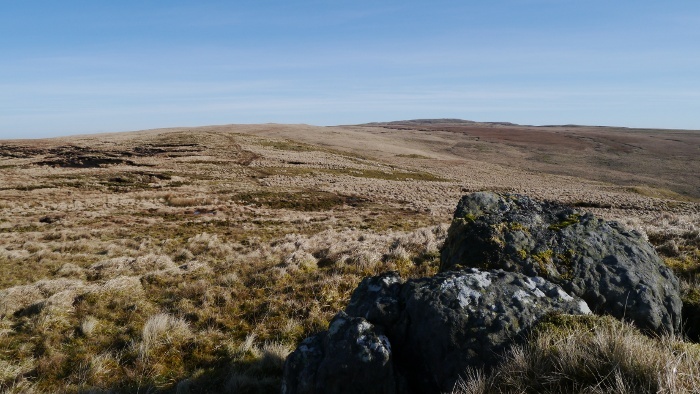 The final slopes of Drygarn Fawr were punctuated with rocky outcrops giving variety to the grassy terrain. The summit is unmistakable as it is adorned with a huge beehive cairn which strangely gave no shelter from the strong biting wind. I had thought about camping on the summit but I soon realised that it was too windy to make a comfortable pitch. On a calm evening it would be a perfect place to while away the hours. 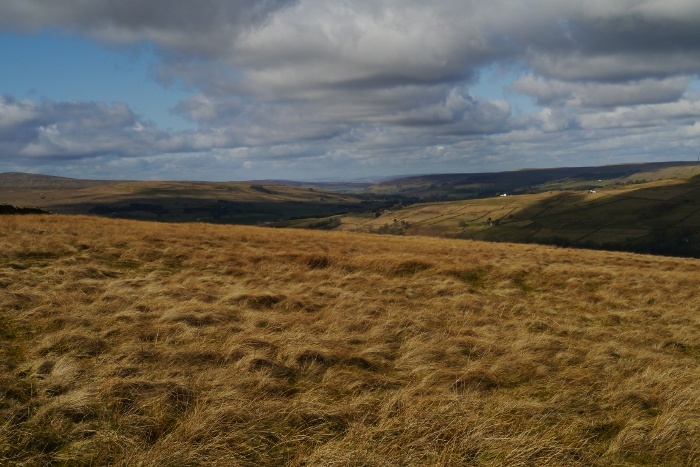 The views are extensive reaching from Pumlumon Fawr in the north to the Brecon Beacons in the south. 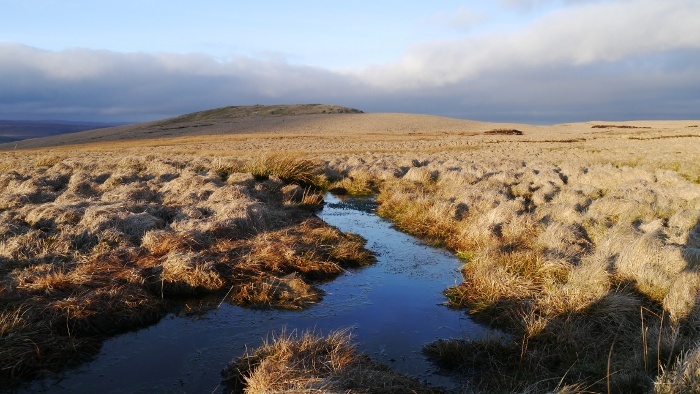 Instead I decided to have a punt at the nearby hill of Carreg yr Ast which rises above the surrounding bogs and tussocks. I ignored the bridleway marked on the map as it simply does not exist on the ground. We made a beeline for the second huge cairn and then followed a grassy ridge just above the rough stuff. The views were magnificent to the south where the skies were beginning to clear. Veering to the left a final squelch was necessary in order to head directly up the widely spaced contours to Carreg yr Ast. 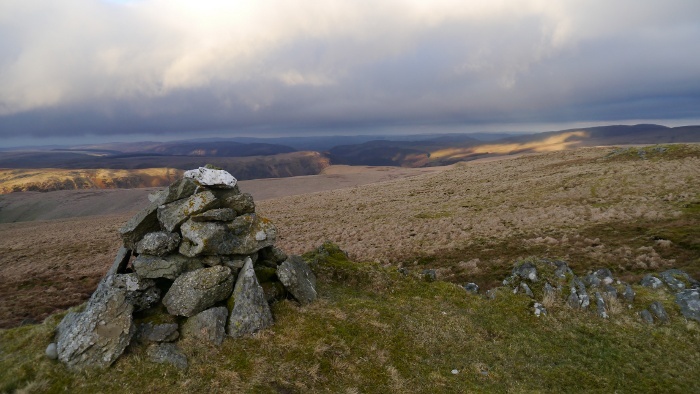 The summit was much less windy than Drygarn Fawr, although still pretty breezy. 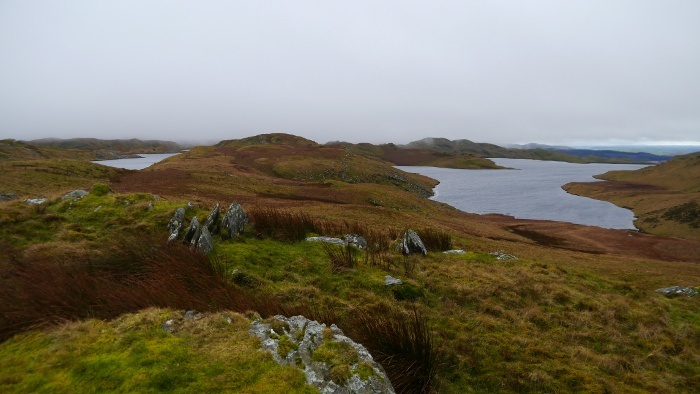 The grass was at its shortest around the cairn which gave broody views across the extensive Elan Valley moors. 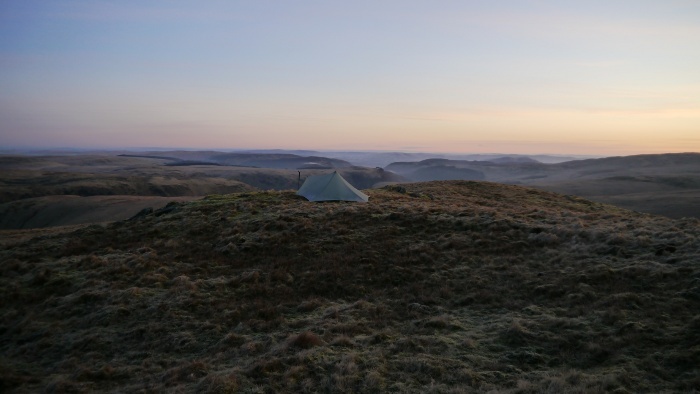 However a flat spot big enough for the Trailstar could not be found and I walked off to spend fifteen minutes going round in circles looking for the best spot to call home for the night. 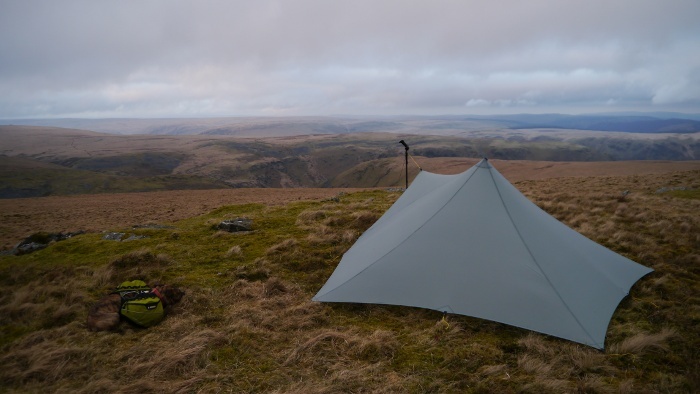 The Trailstar was pitched facing to the north, a swell of very bleak moorland rising and falling to the far horizon, no man-made structure visible. Low clouds were drifting across from the west giving an inhospitable feeling to camp in the fading light. I still needed to collect water and the nearest stream was downhill and several hundred metres away. I set off through the tussocks with a torch in my pocket, Reuben close behind. 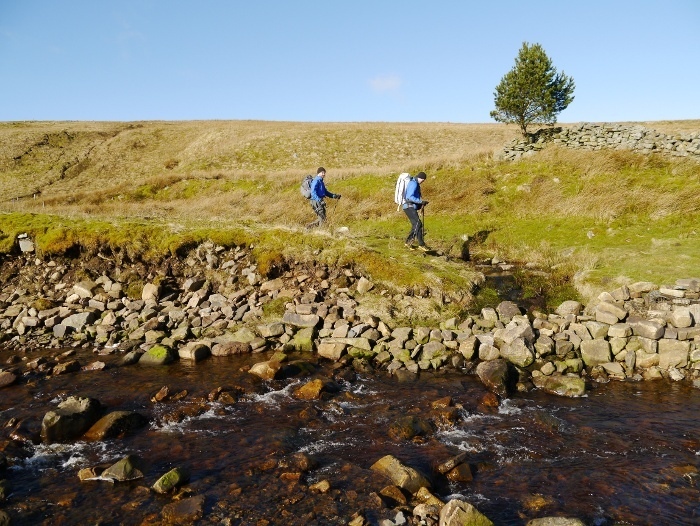 With several litres collected it was a long and slow return back to the Trailstar. In the half-light I started wondering what I would do if my shelter was no longer there or I could not find it. My imagination often starts to run away when I am on the hills alone just as night is falling. Of course it was there and I settled in for the night, cooking dinner and reading post apocalyptic fiction on my Kindle. It took an age to get to sleep, the wind whipping under the shelter felt like it was blowing straight through my sleeping bag. 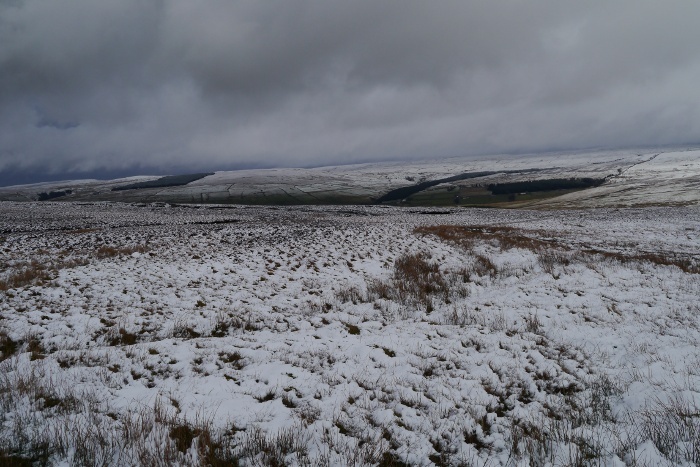 My body warmth was getting stripped away and blown across the damp moor. 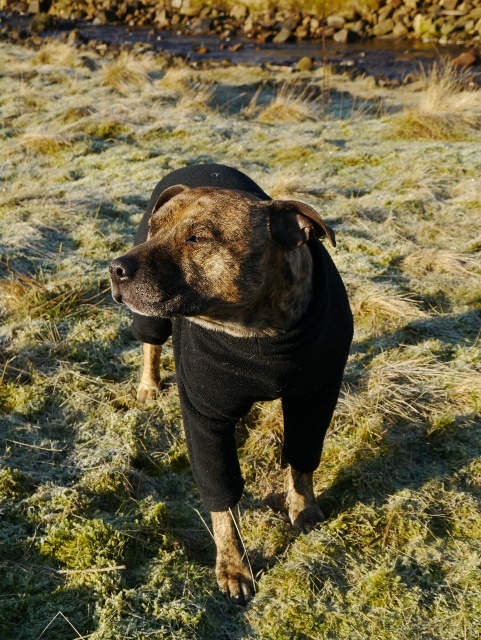 Even Reuben in his fleece romper suit was shivering. I put on my down jacket and moved closer to the dog, eventually drifting off to sleep. I sensed a change in the weather even before I opened my eyes. 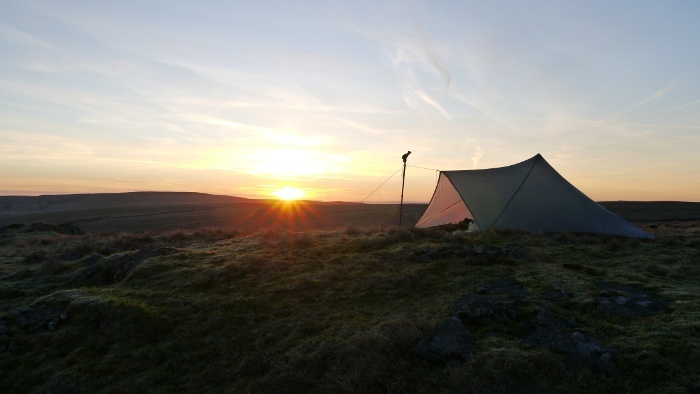 I rolled over onto my stomach and peered out of the Trailstar into the pre dawn light. The sky was totally clear with the last of the stars fading away, the horizon tinged a dark pink. Sitting and firing up the Caldera stove I brushed against the nylon of the shelter, it was coated in frost. With a hot drink in my hand I exited the shelter into a magical world. The clarity of the air was wonderful in the soft light. The Brecon Beacons which the day before had been in the far distance appeared to be in touching distance, a pink veil above them. 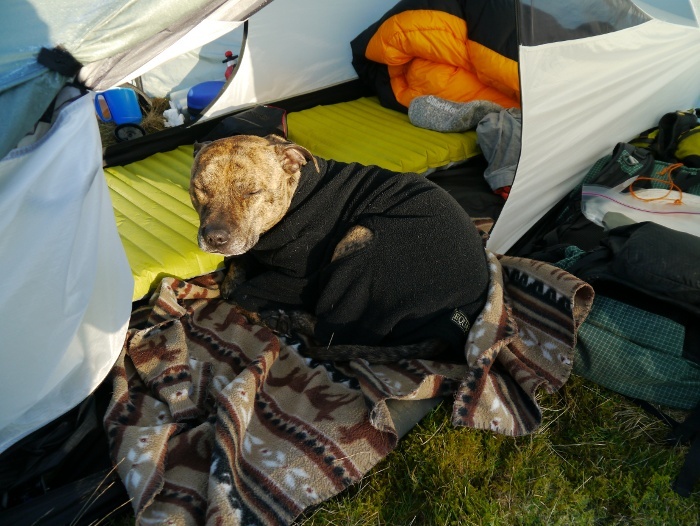 Reuben refused to get out of bed and I wandered around camp alone in a bid to keep warm. Suddenly the sun burst over the horizon, the pink glow turning to vivid oranges and reds as the rays hit the frozen ground. I stood there for a while transfixed and then ran around firing off scores of photographs which can not do justice to what my eyes witnessed. 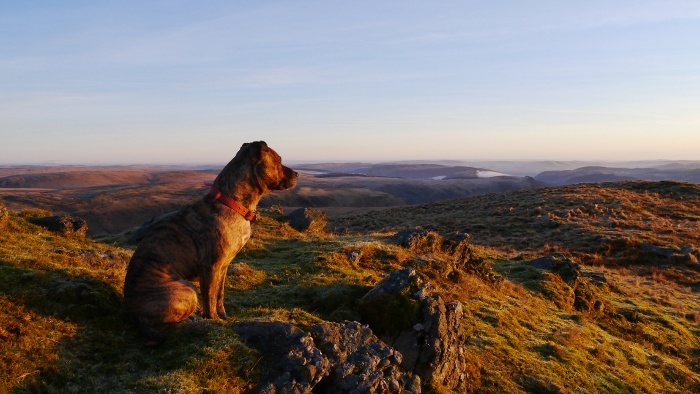 With the sun fully up and the temperature just beginning to nudge on the positive side of zero, Reuben finally joined me to provide a bit of foreground interest to the photos. With the ‘magical hour’ gone we both retired back to the Trailstar for breakfast. With the rays of the sun shining through the fabric it actually felt rather warm and I lazed around for a while, not particularly eager to pack. I have to admit that I then began to regret not setting out with two days food for both myself and Reuben. 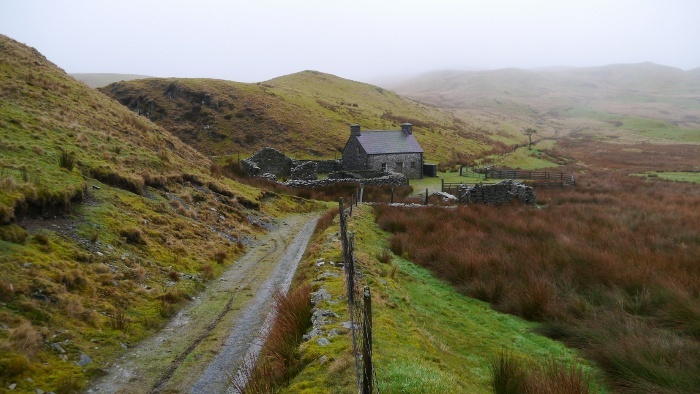 I really fancied spending another night in the hills without returning back to the car, perhaps walking to Moel Prysgau bothy. The weather by now should have been low cloud and drizzle, thankfully the forecast was drastically wrong. 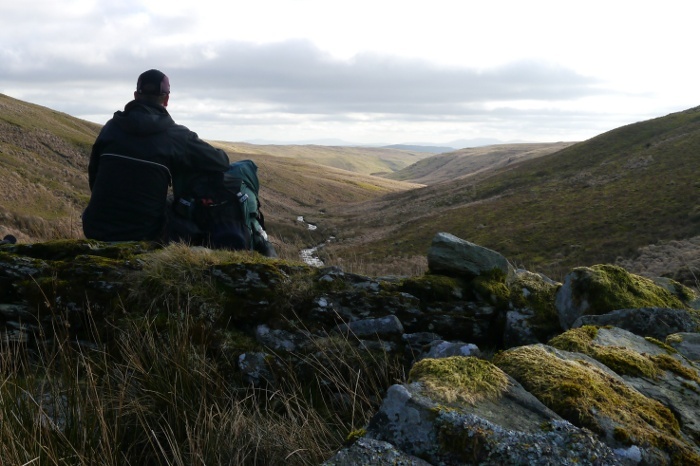 A day on the high moors followed by night in the forest bothy appealed. Sadly I would have to walk back to the car to get more supplies before heading out again. 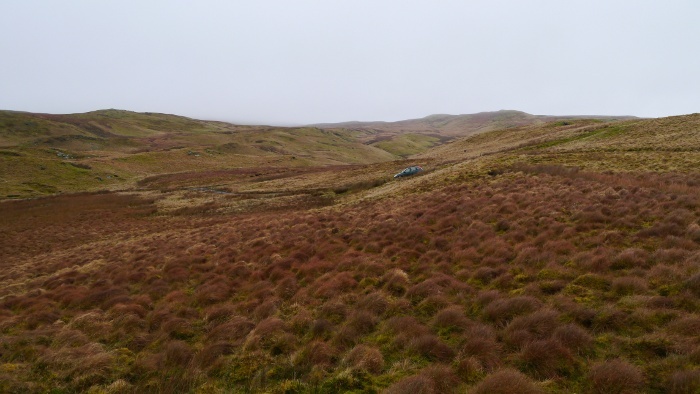 I quickly packed and headed towards the distinctive cairned top of Carnau, another dry grassy prominence above the bog and tussocks. To the south I could identify the Black Mountains, the central Brecon Beacons, the Fforest Fawr hills and the Black Mountain, all appearing as a huge wall of shapely peaks. Sadly my camera could not capture the scene effectively due to the haze and bright sun. Instead I had to be content with capturing my immediate surroundings, including the nearby peak of Gorllwyn which also breaks the 2000ft contour. Time passed quickly whilst I was doing not very much at all, more time spent sitting than walking already. 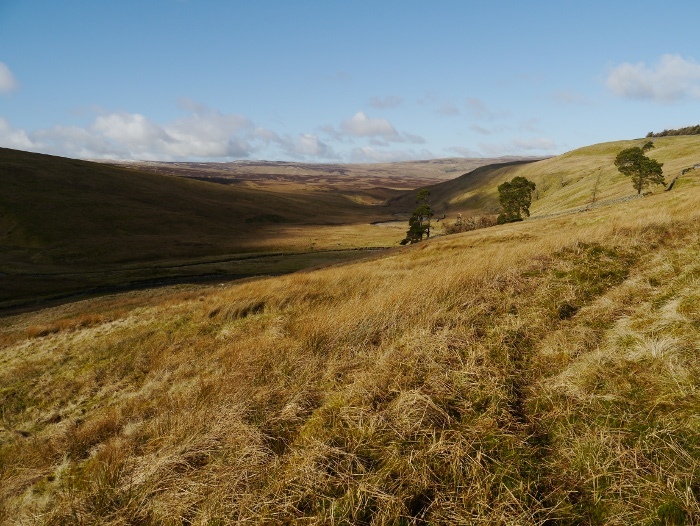 The line of another non-existent bridleway was located and I set off down hill towards an extensive tract of forestry, making the most of the open moors while they lasted. An abandoned farmstead was explored at Pen-cae, one of the abandoned but locked cottages looked like it would make a cracking bothy. Otherwise the surrounding buildings had an air of damp decay about them, the dark of the conifers adding to the sense of gloom. Descending steeply downhill a confusing junction of tracks was met, none of which were marked on the map. I made an educated guess and successfully located the correct bridleway, stopping to remove layers next to a footbridge over a sparkling stream. In the shelter of the valley it was warm and I continued in just a baselayer, enjoying the first taste of spring. This secret little hidden valley was a gem, a mixture of open pasture, birch, moss-covered boulders and forestry. A steep climb to the ridge above was punishing in warmth that my body was not used to. I made a mistake in removing my gaiters as it was so warm, to then almost immediately find myself squelching through an incredibly boggy forest ride. An undulating bridleway then took us across splendid Welsh pastures via little secretive wooded dells and hidden cottages back to the car. It was annoying to be back so soon but I noticed that the weather had suddenly changed. High level cloud had blocked out the sun and a cool wind started to blow down the valley. I repacked my rucksack and located a bag of coal and another of wood. 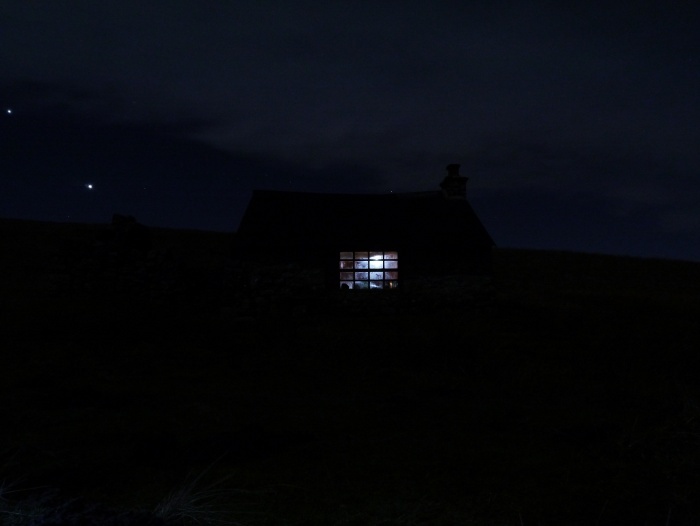 It was time to head out for a night in a remote bothy.